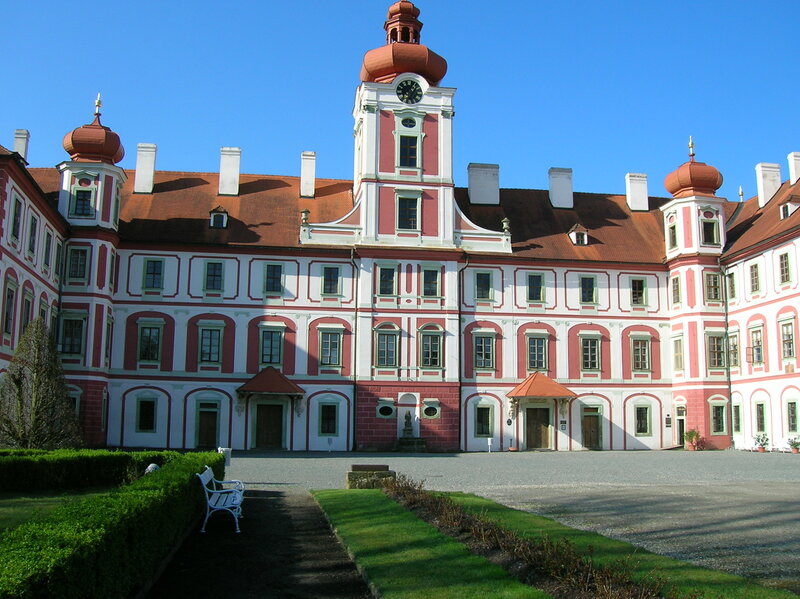 This was my second visit to Mělník Chateau, located less than an hour from Prague by bus. I was enthusiastic about getting reacquainted with the interior that I had so admired during my first time here. Back then, there had been no guided tours. Visitors were given a text to read while they walked through the chateau’s rooms. This time I would have a tour, so I was excited about seeing the chateau from a new perspective. I knew a bit about the history of the chateau already, and what I did not remember I perused in a booklet that I had bought at the box office, which also served as the souvenir shop. 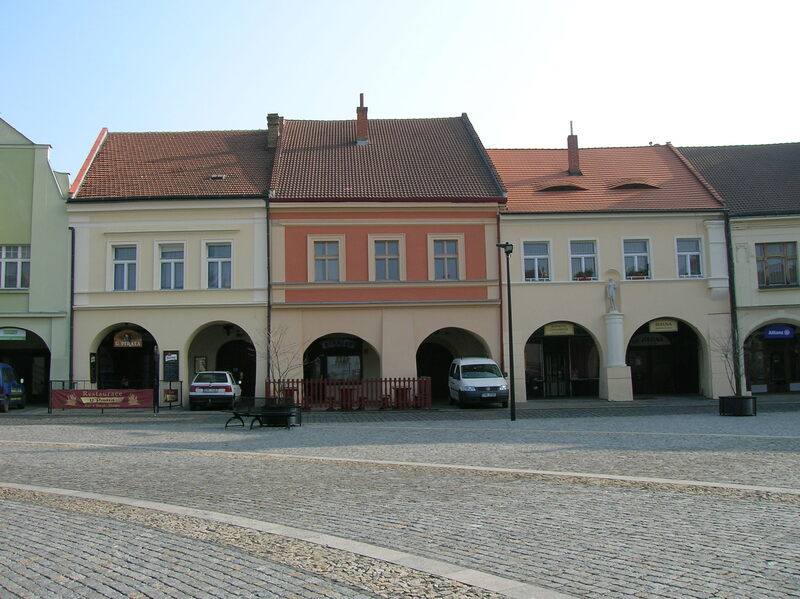 Mělník’s history is closely connected with Czech legends. Supposedly, Princess Ludmila often resided in the town while raising her grandson, Wenceslas (Václav), who would later become a well-respected duke of Bohemia and after his death the patron saint of the country. 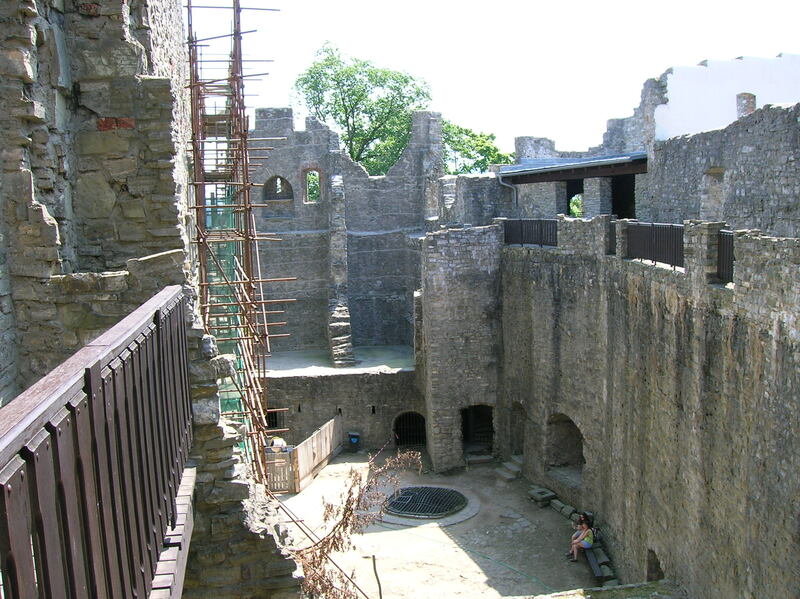 The original wooden structure was changed into a stone castle during the 10th century. Spouses of Bohemian princes owned the castle, which got a Gothic makeover in the second half of the 13th century. 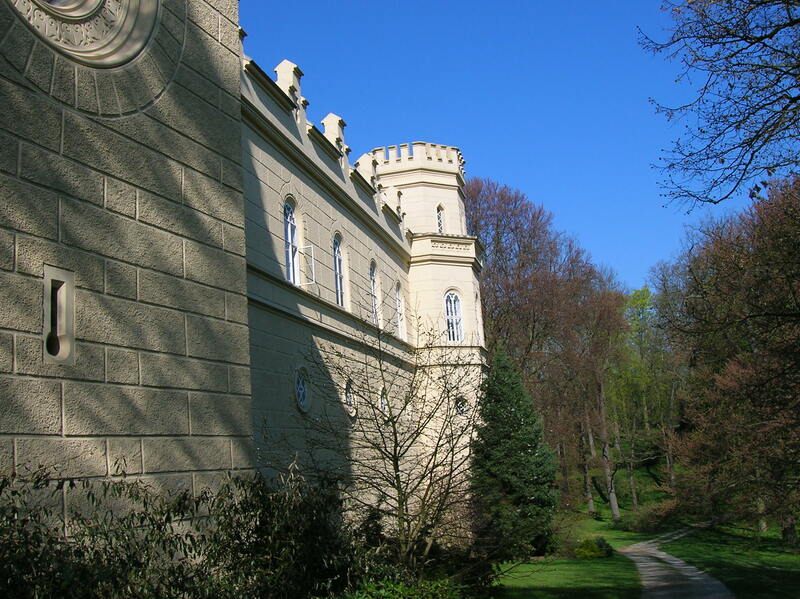 The castle became home to Bohemian queens during Holy Roman Emperor Charles IV’s reign. Emperor Charles IV, who was responsible for building Prague’s New Town, the Charles Bridge and Charles University, supported winemaking in Mělník and the surrounding areas. He even imported burgundy grapes. 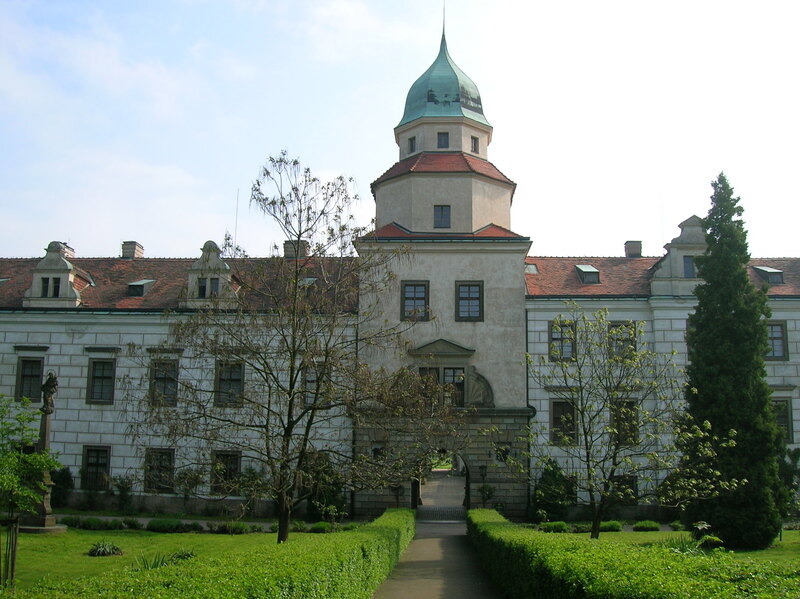 Queen Elisabeth Přemyslid, the last wife of Emperor Charles IV, resided in the castle for a lengthy period and died there. She was responsible for building the chapel. The Přemyslid dynasty had ruled Bohemia from the 9th century to 1306. The castle was given Late Gothic features in the late 15th century. 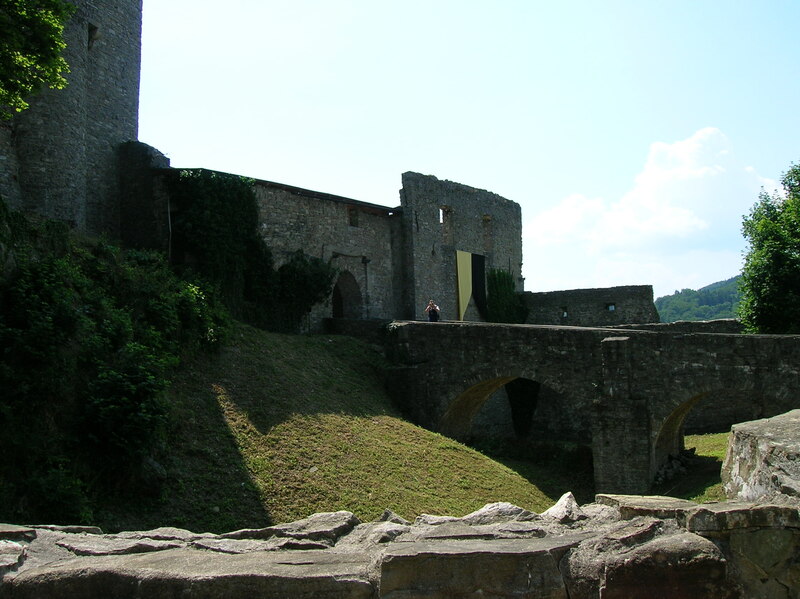 During the following century, it was changed into a Renaissance chateau. The reconstruction was finished during the 17th century. While the castle became decrepit during the Thirty Years’ War of the 17th century, it was soon repaired. Then, in 1753, one of the most significant events in the chateau’s history occurred. Marie Ludmila Countess Czernin wed August Anton Eusebius Lobkowicz. 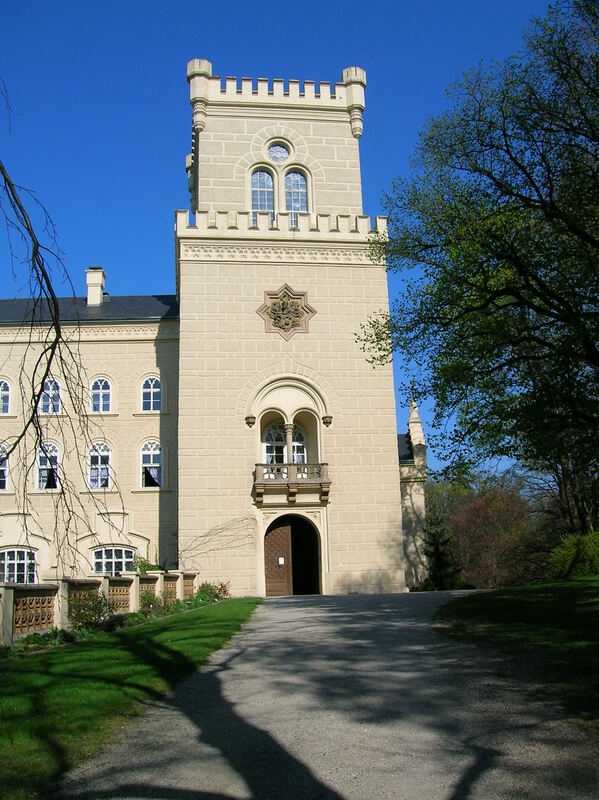 The castle would remain in the Lobkowicz family until 1948, when it was nationalized after the Communist coup that instigated 40 years of totalitarianism in Czechoslovakia. 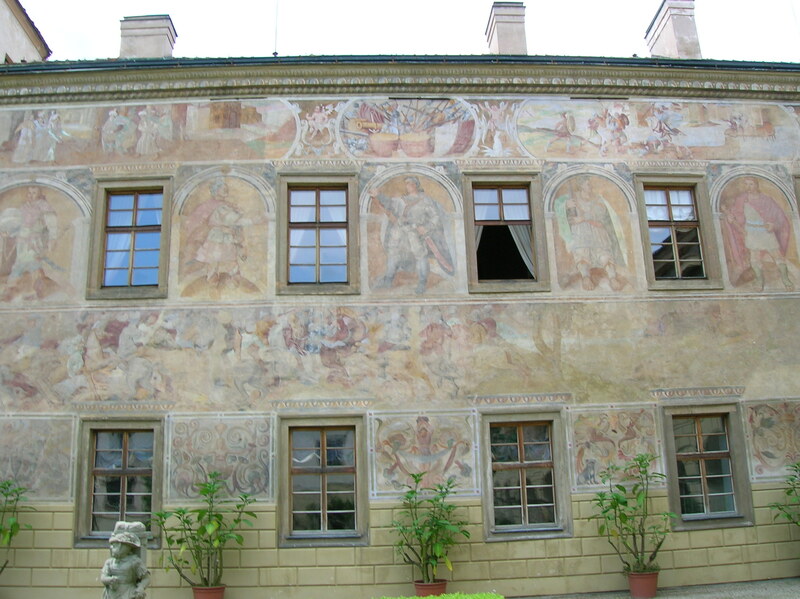 I envied the fact that the Lobkowiczs had played such prominent roles in Czech history. 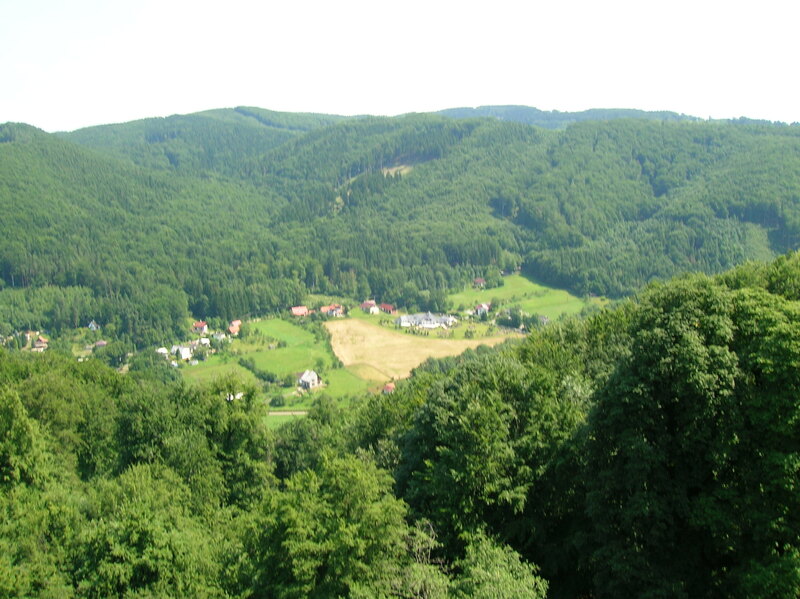 In the early 15th century Nicolas was given the village of Lobkovice nad Labem by King Wenceslas IV, and he took the name of the village. George Popel Lobkowicz of Vysoký Chlumec held the post of the highest chamberlain of Emperor Rudolph II. Zdeněk Vojtěch became the highest chancellor of the Bohemian Kingdom. His son, Wenceslas Eusebius, served as the highest chamberlain in the kingdom and as president of the secret services during the 17th century. In the following century John George Christian was made a prince due to his military achievements. Anton Isidor was one of the founders of what is now Prague’s National Gallery. George Christian served as supreme marshal of the Bohemian Kingdom and was a member of the Bohemian Parliament during the 19th century. But there would be dark, turbulent times for the Lobkowicz clan. During World War II the Nazis took over the chateau. The family took refuge in Prague. Then came 1948 and the Communist coup. 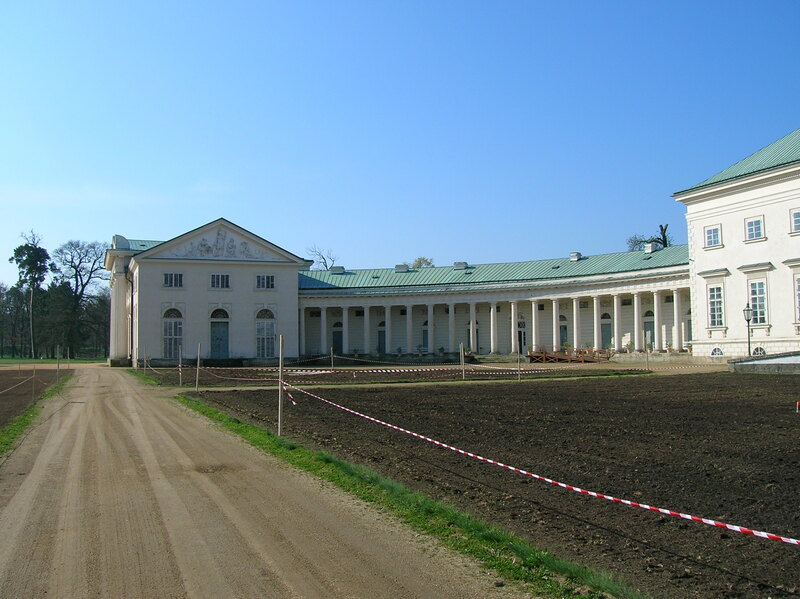 The Lobkowiczs fled the country, and the chateau was put in the hands of the state. The present owner of the chateau, George John Prince Lobkowicz, moved to the homeland of his ancestors from Switzerland in 1990. He has been owner of the chateau since 1992 and currently resides there. I also envied the fact that the Lobkowiczs could trace their ancestry so far back. I knew that my Slovak ancestors had been potato farmers in east Slovakia. I even met a few very distant relatives about 10 years ago, but, unfortunately, they do not keep in touch with me anymore. On the Czech side of the family, I know that my great-grandparents were from somewhere near Prague or from Prague itself. 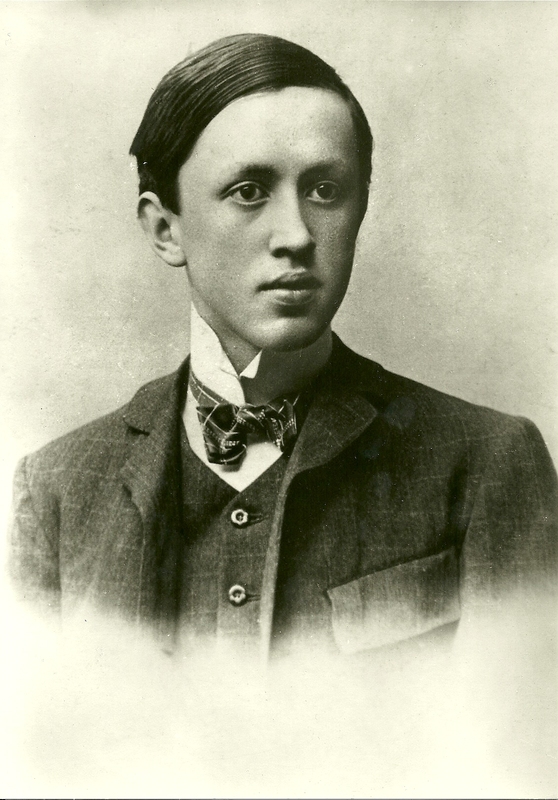 They had a common surname – Šimánek. I also know that I had ancestors from somewhere in Moravia, with the popular Czech surname Mareš. I moved to Czechoslovakia in 1991 partially because I felt a strong association with the country of my roots and intuitively felt that it was a part of my personal identity. If only I knew more about my ancestors, and if only they had played such prominent roles in Czech history as had the Lobkowiczs! Yet, at the same time, I was not sure that I wanted to know more about my ancestors. 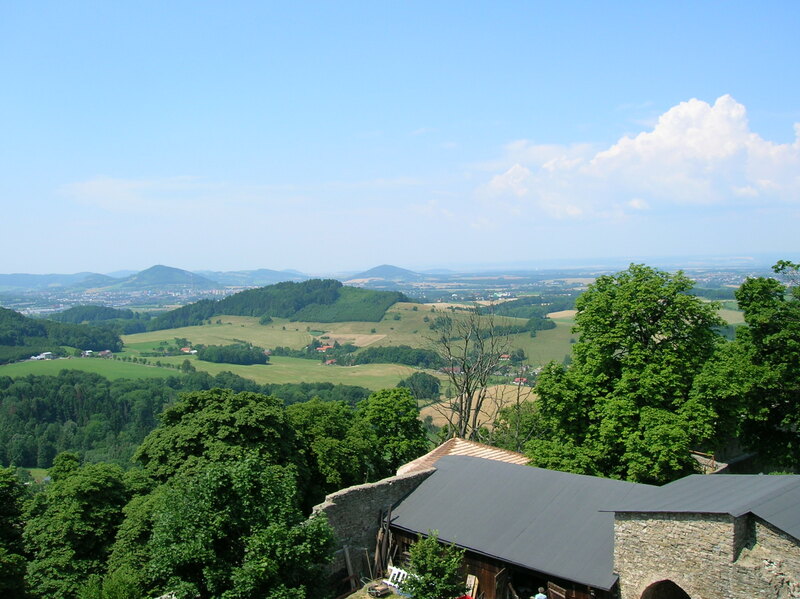 I had visited the village in east Slovakia where my great aunt had come from, and I was going to look for an inhabitant with the same – not common – last name as my great aunt’s maiden name. But I decided not to because I was scared. While I wanted to meet long lost relatives, I was also scared of finding them. Scared they might not like me or that I might not like them. What if they had been Communists? What if they were mean people? What if they hated Americans or wanted money from me because they thought all Americans were rich? I studied the impressive exterior of the chateau. I loved the elegance of the Renaissance arcades with decorations on the walls. 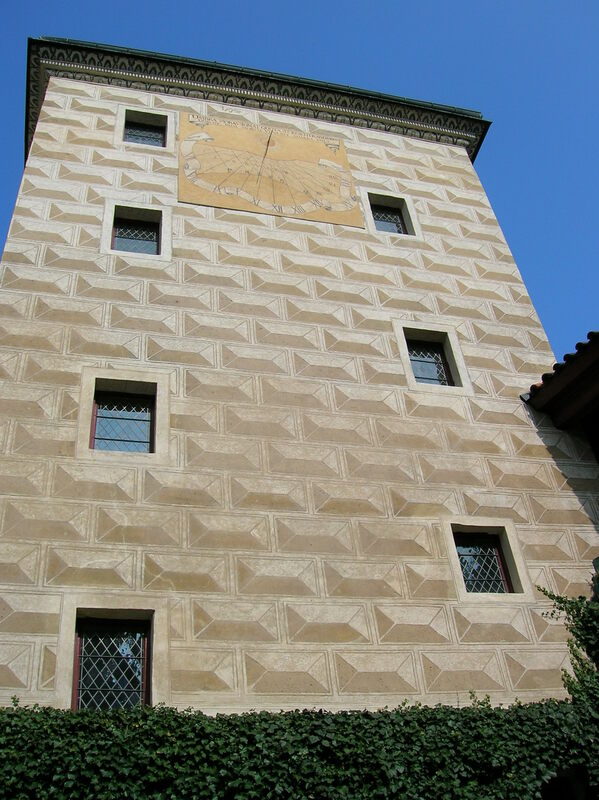 A sundial also adorned the façade. There was sgraffito, too, which I adored. 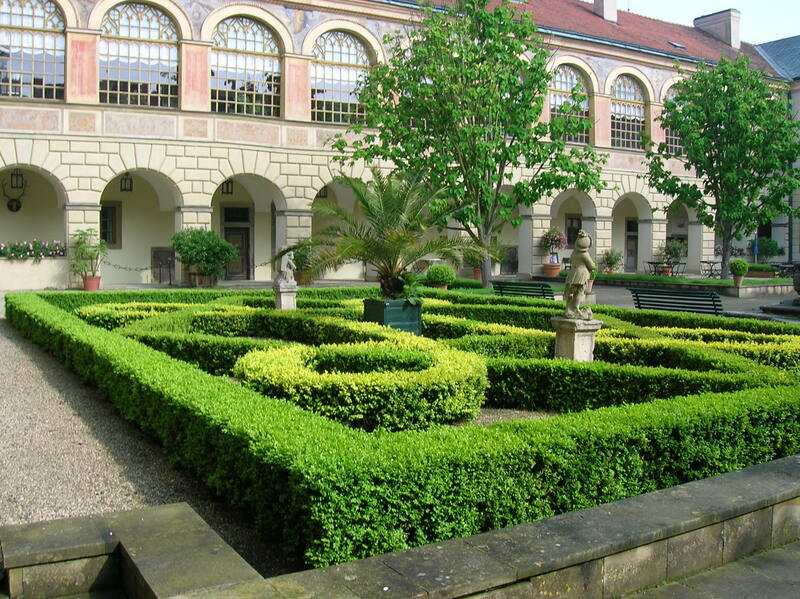 The other wing was built later, in the 17th century, in Baroque style. After admiring the Renaissance arcades for a while, I noticed that it was time for the tour to start and I entered the souvenir shop, ready for what I was sure would be an impressive walk through the ages of Mělník’s top sight. The guide, a serious and well-dressed woman, described some of the background of the chateau and Lobkowicz family, and it was clear that she was very professional and knowledgeable. The first room was called the Bedroom of George Christian, named after a Lobkowicz who died tragically at the age of 25 in a racing car accident in 1932. I was reminded how we have to treasure each moment in our lives and see the beauty in daily life because we never knew when our time will be up. I was captivated by a Baroque closet flaunting intarsia. 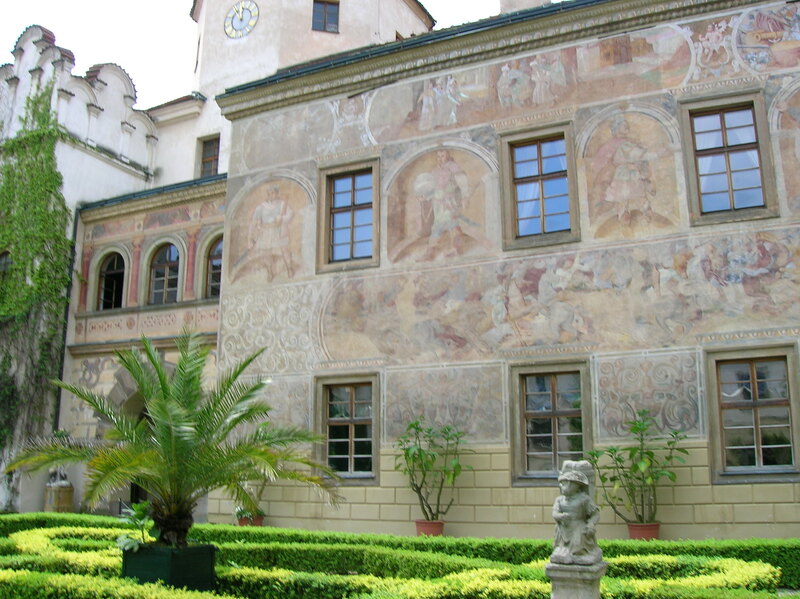 The painted decoration high on the walls showed plant leaves with vases in green and brown. The colors seemed to go well with the 17th century Baroque furniture. On the headboard of the Baroque bed was a painting of a Madonna that appealed to me. I also took note of the richly carved wood of the bed. Portraits of the Lobkowicz family adorned the room, too, and one of the paintings had been executed by master Czech Baroque artist Karel Škréta. 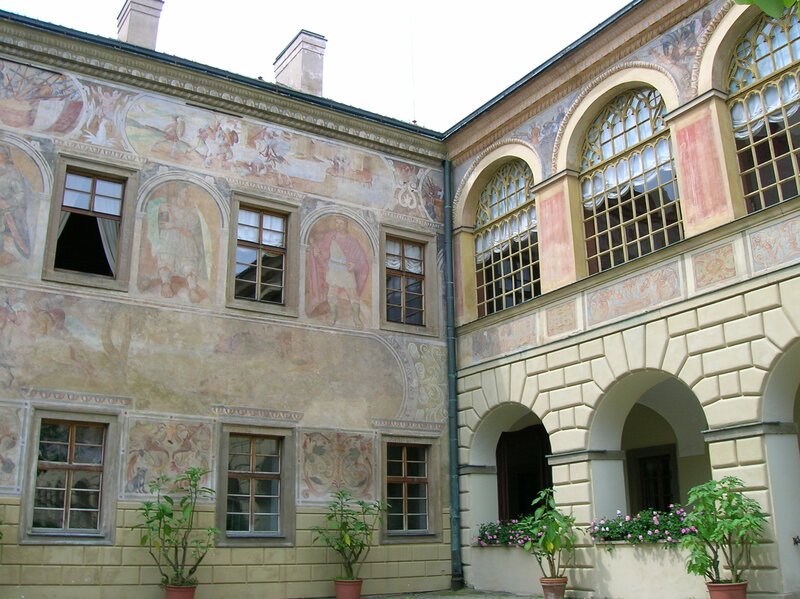 August Longin’s Study was named after a Lobkowicz who had befriended Johann Wolfgang von Goethe, a visitor of Mělník. The room featured two exquisite French desks – one hailing from the 17th century and the other from the 18th century. The older one was inlaid with tortoiseshell, plated brass and tin in ebony wood, made in the Boulle style. The 18th century desk, celebrating the Rococo style, was made of gilded bronze and plated brass. I particularly admired the gold decoration on the younger desk, the one that had been stolen during the totalitarian era. It had wound up in an office at the Ministry of Culture. However, that was not all the room had to offer. An 18th century table with mother-of-pearl hailed from Japan and had designs of fans on its top. There was also a portable 18th century toilet near the room. Small portraits of Habsburg rulers hung on one wall. I spotted Holy Roman Emperor Joseph II and Empress Maria Theresa right away. The next room was the Children’s Room with toys from the 19th century, including dolls and a puzzle. Porcelain in a cabinet hailed from Hungary. The 18th century bed in the room was short, but it was standard size for adults at that time. People slept sitting up because they were afraid they would die if they lay down. I admired the rich, wooden carving of the bed and the Madonna on the headboard. The Big Dining Room featured two Baroque bureaus from the 17th century. They were inlaid with tortoiseshell and adorned with gilded decorations. Some of the pictures painted on them focused on seascapes with ships. The chairs were upholstered with tapestries. The guide pointed out two valuable 17th century lunettes by Škréta; they were part of the story of the life and death of Saint Wenceslas, who, according to legend, had resided in Mělník when he was a child. Other breathtaking paintings rounded out the room’s décor. The Grand Drawing Room featured 18th century furniture. I noticed two 18th century Rococo tables with gilded brass angels decorating the legs. Portraits of the prominent politician George Christian and his wife Anna were rendered by Czech painter František Ženíšek, who had also decorated the National Theatre. More astounding works of art adorned the walls, some portraits of the Lobkowicz family, others biblical paintings and still others sporting themes from antiquity. I spotted Helen of Troy in one rendition. I was drawn to the white furniture and pale green walls. It looked airy and light and exuded an atmosphere filled with joy. Chinese and faience porcelain as well as ceramic vases from Asia made up the room, too. The hallway was adorned with a bust of Parliament member George Christian. It had been created by Josef Václav Myslbek, a master of modern sculpture working in the 19th and early 20th century. Engravings featuring carriages decorated one wall, too. I was drawn to other works of art – the pictures of romantic 18th century Prague, especially to Old Town Square, my favorite part of the capital city. I remember the first time I stepped onto Old Town Square. I felt an unexpected electricity, a strong connection with the city and country. I was only a tourist at the time, but at that moment I knew I had to return to live in the homeland of my ancestors. Perhaps the most astounding room was the Big Hall with Maps and Vedutas that came next. The maps and vedutas hailed from the 17th century. I noticed maps of Italy, France and the Netherlands. Then there were all the big vedutas of European towns on the walls. It was so breathtaking that it was almost overwhelming. The veduta of Prague featured only one bridge, the Charles Bridge, without any statuary decoration. Strasbourg, Nuremburg, Regensburg, Venice, Florence, Seville, Madrid and Brussels were just a few of the other cities represented. The detail of the maps and vedutas was more than impressive. Most of them were made in Amsterdam. Perhaps I was so drawn to this room because I loved maps so much. I used to buy maps of Czech towns I had never been to and wondered what each building and each street looked like as I took a an imaginary walk through the town. Two large maps decorated my living room – one of the Czech Republic and another of Slovakia, as I treasured memories of Czechoslovakia. I often traced the routes from Prague to various chateaus and impressive towns and thought about my adventures there. 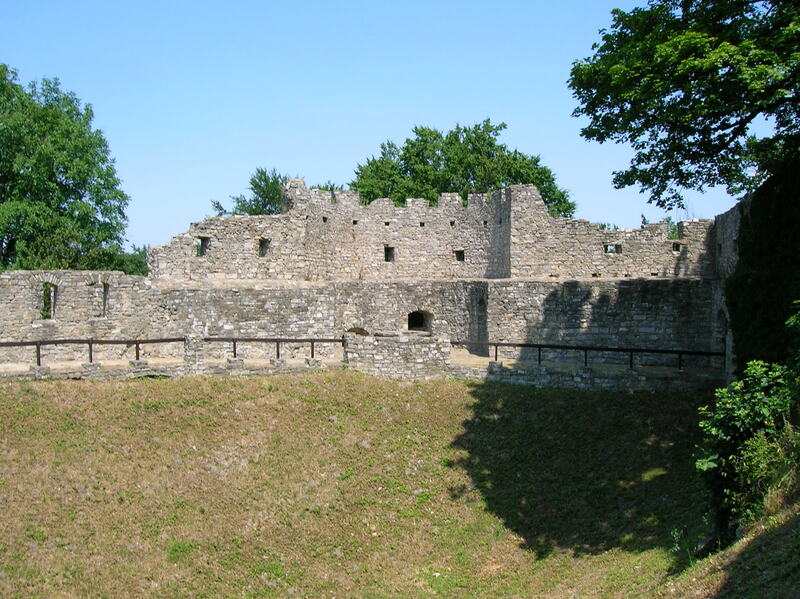 On the map of Slovakia I found Špišský Castle, below which some very distant ancestors were buried, and traced paths to Poprad, Kežmarok and Bratislava. 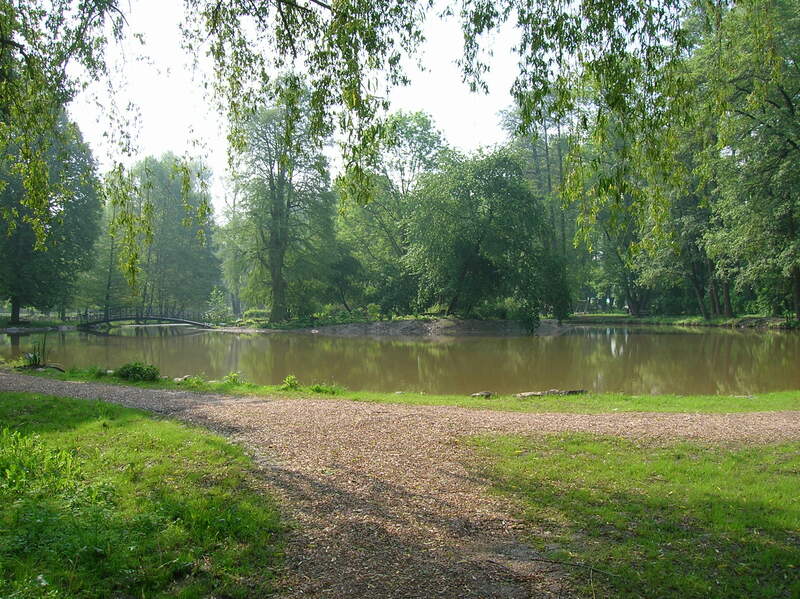 I found Morské Oko in the Vihorlat, near my great aunt’s home village, and traced the path to Košice and Michalovice, where I had heard that some of my other ancestors had hailed from. 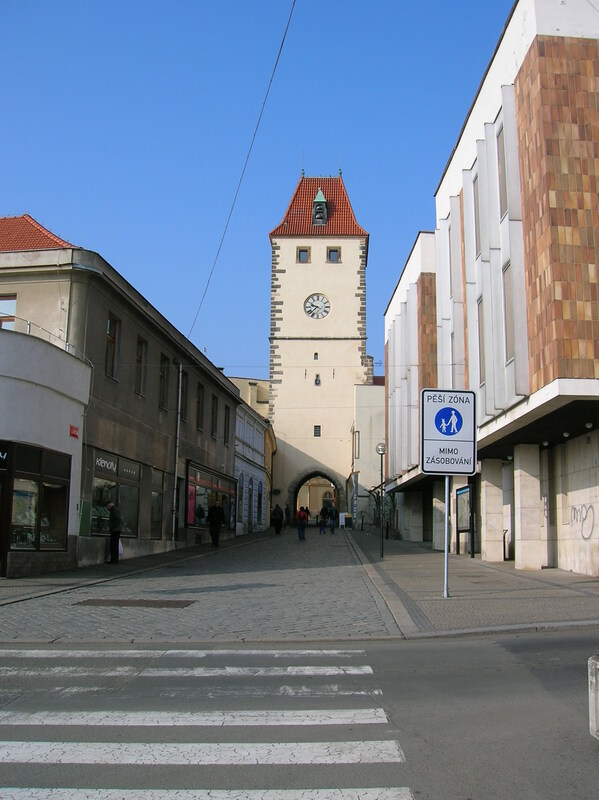 I found more places I had visited – Humenné, Levoča and Trenčín, for example, and recalled moments of happiness and discovery. Back to the tour. The Knights’ Hall featured 16th century suits of armor on the walls. An 18th century oak table also caught my attention. In the Small Hall with Vedutas, various weapons from the 17th to 19th century were displayed. However, what really caught my attention where the black-and-white vedutas of European cities during the early 18th century. I was entranced by the vedutas of Prague and Brno. Some military equipment on display came from 17th century Turkey. I also admired the richly carved Chinese furniture. I have always been an admirer of wooden Chinese furniture. The vast Concert Hall was still used for concerts, balls and other events. 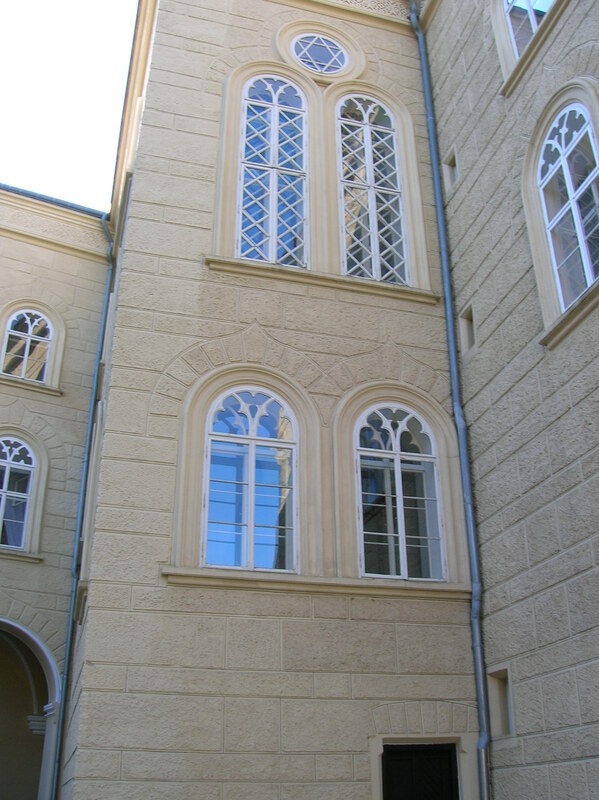 It was situated in the Baroque wing of the chateau, but the construction of this part had not been finished until 2005. There was an original 16th century wall with sgraffito decorations that delighted me. I’ve always been a big fan of sgraffito! The opposite wall was a copy made in this century, but, faithful to the original plan, it complemented the authentic side. I looked up and saw a painted coffered ceiling. Vedutas of Versailles and its park from the 17th century adorned another wall. Drawn to these works of art, I thought back to my visit to Versailles, during a warm February afternoon and how impressed I had been with the vast French chateau. Then we went downstairs, passing by colored lithographs of Prague sights from 1792 and 1793. We wound up on the first floor in the lavish Grand Dining Room. 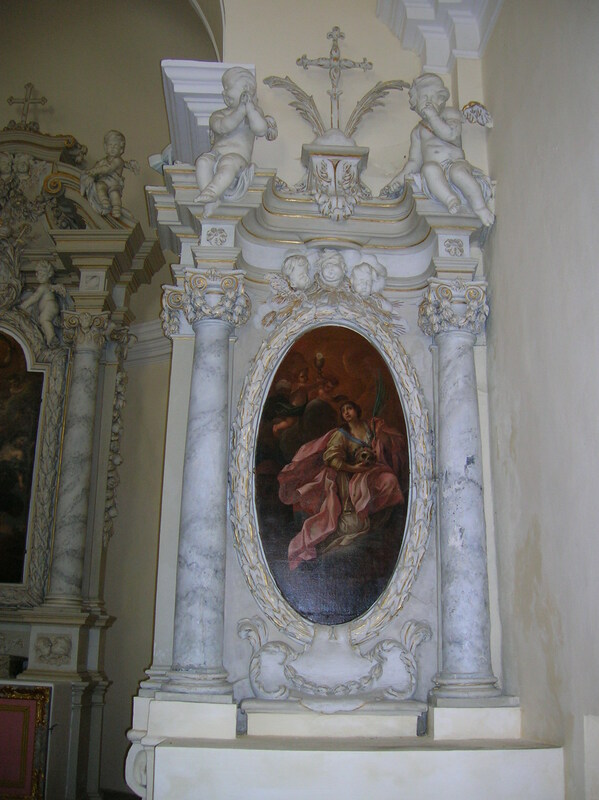 Exquisite Baroque paintings adorned the walls. I loved the gold-and-white decoration on the pink-colored ceiling. The silverware hailed from the 18th century, and the guide pointed out Viennese porcelain as well as white Sèvres porcelain. The highlights of the room, though, were two paintings. One was another lunette from the cycle of Saint Wenceslas by Škréta. There was also a spectacular painting called “Christ with Veronica” by Paolo Veronese. It portrayed Christ on the cross with a self-portrait of the painter as the carrier of the cross. The chapel was last. It hailed from the 14th century, built by Queen Elisabeth, the fourth wife of Emperor Charles IV, and was originally dedicated to Saint Louis. During the Thirty Years’ War, the chapel was so badly damaged that it had to be rebuilt, and this time it was consecrated to Saint Ludmila. A painting of Saint Ludmila’s baptism adorned the main altar. Impressive paintings dotted the chapel. Two portraits – of Saint Andrew and Saint Bartholomew – by my favorite Czech Baroque artist, Petr Brandl decorated the space. There was even a painting of an apostle, created by Peter Paul Rubens. Then the tour ended, and I was thankful that I had been led through the chateau by such a professional guide who had given such detailed information about each room. I was very impressed with her knowledge and enthusiasm. I knew how disappointing tours could be if the guides were not good, though most of my experiences with tour guides in this country has been positive. It was much better to have a tour guide than to be given a text and walk through the chateau by yourself, I mused. The guide helped bring the chateau alive. 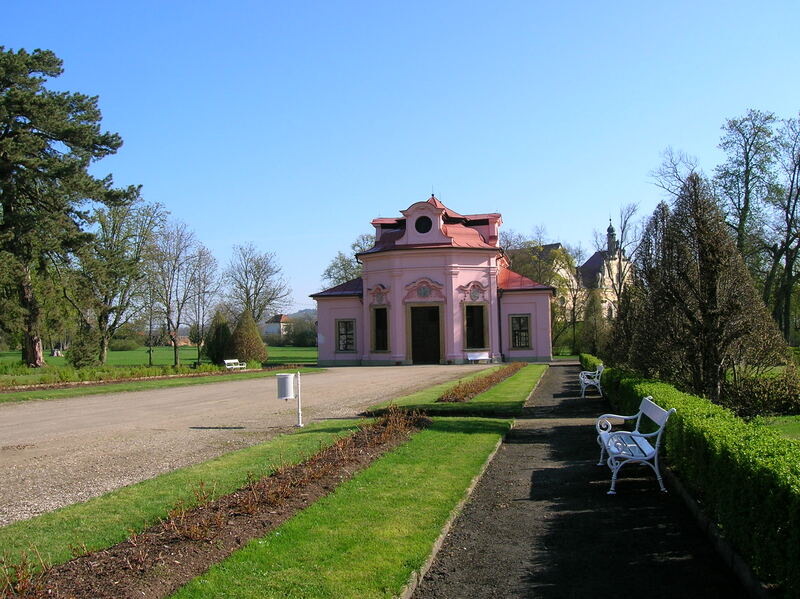 Her words gave life to the chateau that had played roles in Czech history and legends. I think it was possible to tour the wine cellars as well, but I do drink much alcohol and am not very interested in wine. However, there are three floors of historical wine cellars below the chateau: Emperor Charles IV had them built. The Lobkowiczs have a family tradition of presenting a new-born with a new wine barrel. The barrel would be filled a year before the young Lobkowicz turned 18. It was remarkable that wine had played such a prevalent role in the family history. Winetasting tours were available, and if I had liked alcohol, I would have been enthusiastic about taking one of these trips to the cellars with original, wooden barrels. Instead of sampling wine, I ate a delicious meal in the chateau’s restaurant, though they did not offer my beloved chicken with peaches and cheese. Still, I was pleased with the food and the service. I walked around the town and noticed the impressive Renaissance and Baroque houses on the large main square, especially the town hall, which hailed from the late 14th century. Next to the chateau was the Gothic Church of Saints Peter and Paul. Unfortunately, it was closed, but the ossuary was open. I found out that the next tour of the ossuary would not start until after my bus left for Prague. What a pity. I knew I would have to come back someday, to tour the chateau again and to visit this ossuary that I had not known about before this trip. Soon I walked through the decorated gate from 1500 and made my way to the bus station. I immediately caught a bus bound for Prague. When I disembarked at the Holešovice bus station in Prague 7, I was truly happy. 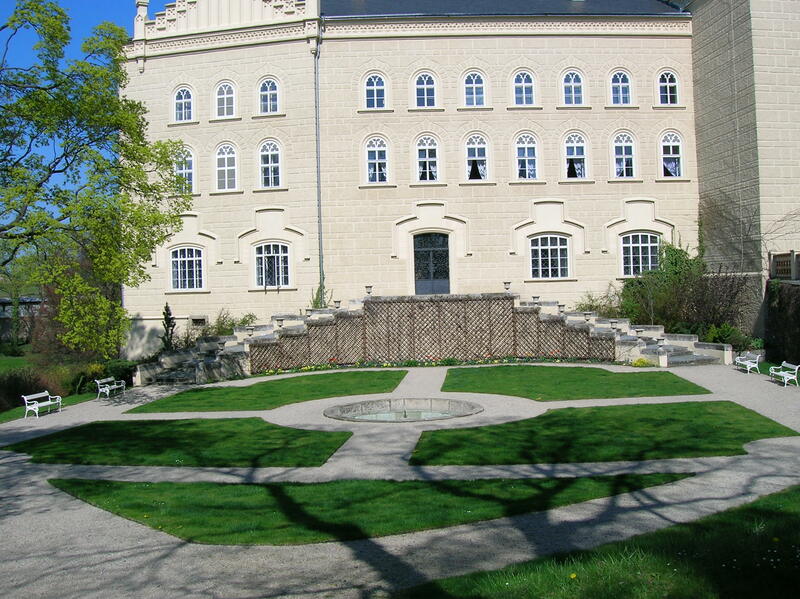 I had had another positive experience at another impressive Czech chateau. My day had been filled with making new discoveries and gathering new perspectives on the Lobkowicz family history, the history of the chateau and my own personal history. The gate dates back to 1500. A bus took me directly from Frýdek Místek to Hukvaldy, where I embarked on the uphill, demanding 20-minute walk in the scorching heat. 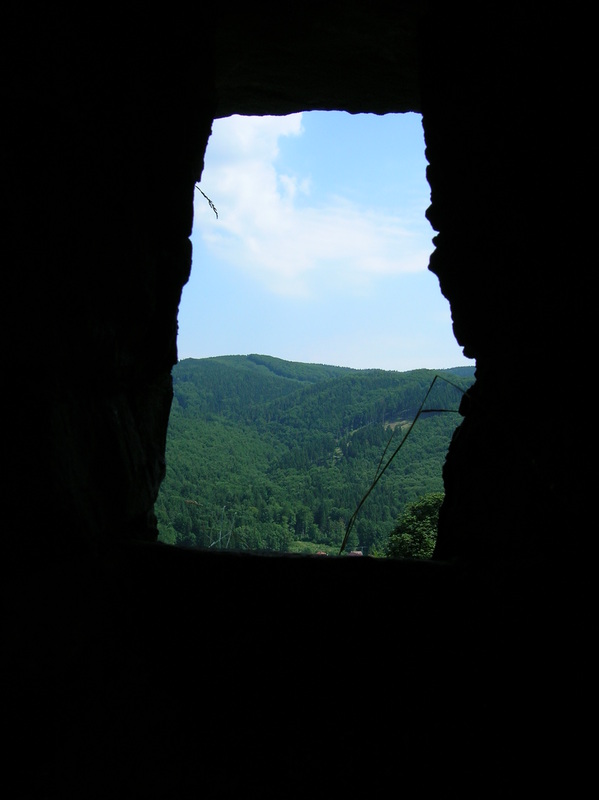 The moment I reached the entrance to the castle ruin in northern Moravia, I was beside myself. 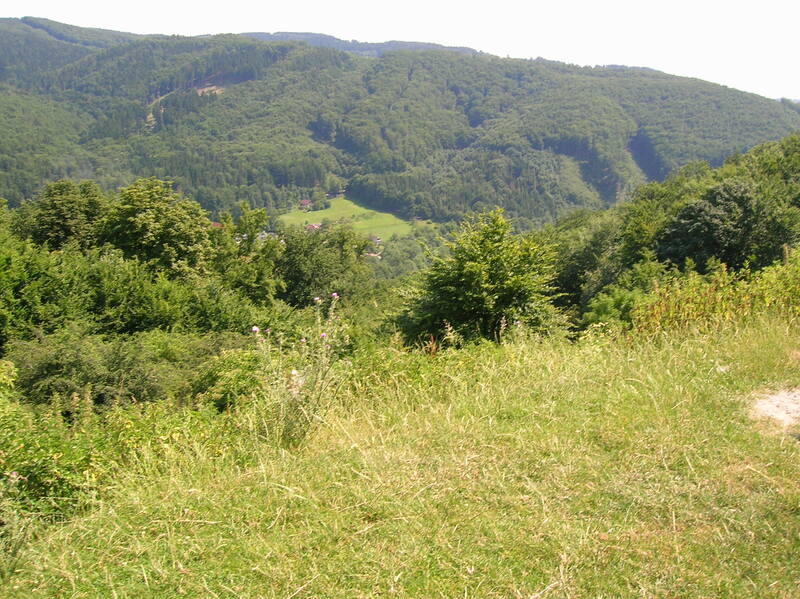 The views to the gentle, green Beskydy Mountains, which loomed in the distance, were magnificent. 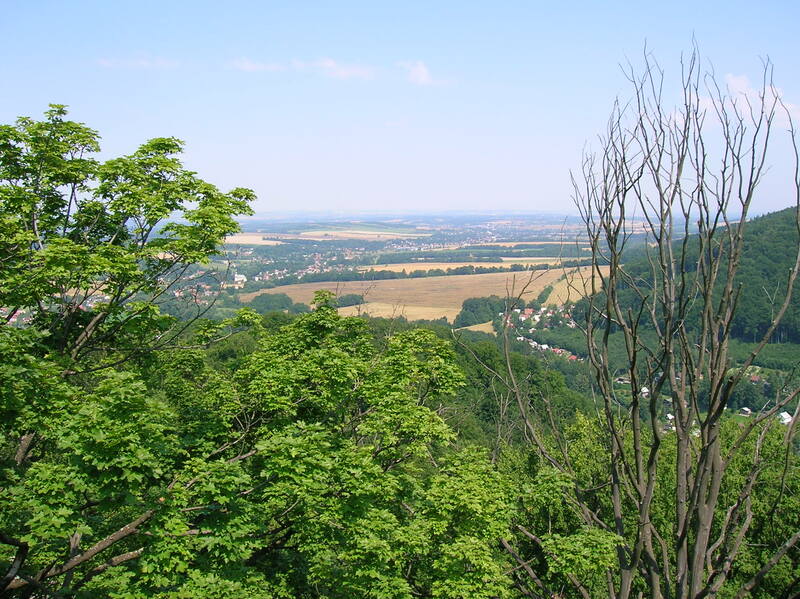 Supposedly, one could even sometimes see as far as the Jeseníky Mountains and Praděd Mountain in the Jeseník region. I saw picturesque, romantic villages in undulating valleys, the lush green of the mountains surrounding the dots that made up the small towns. I wondered if I could see the Polish or Slovak border. The views from the castle ruins are breathtaking. Upon entering the castle ruins, I was in for an even bigger surprise. 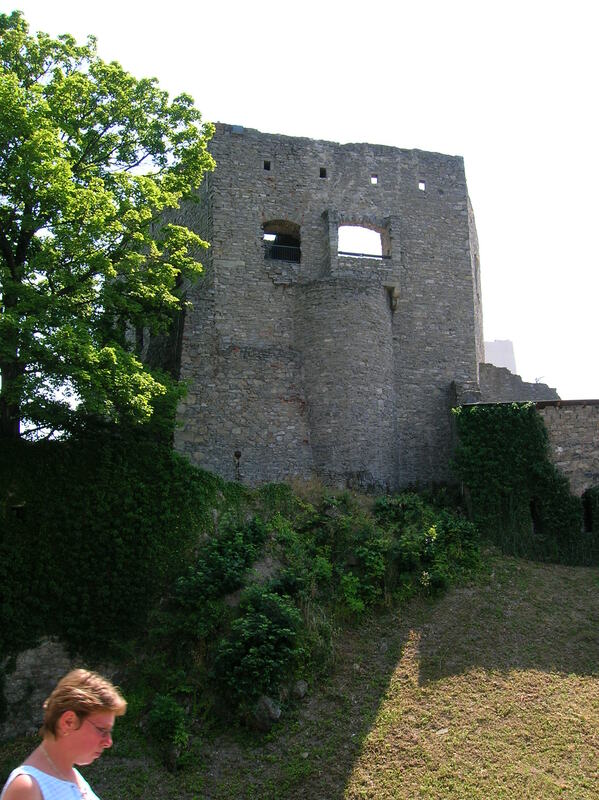 The castle ruins were just as romantic and picturesque as were the views from the wall at the entrance. 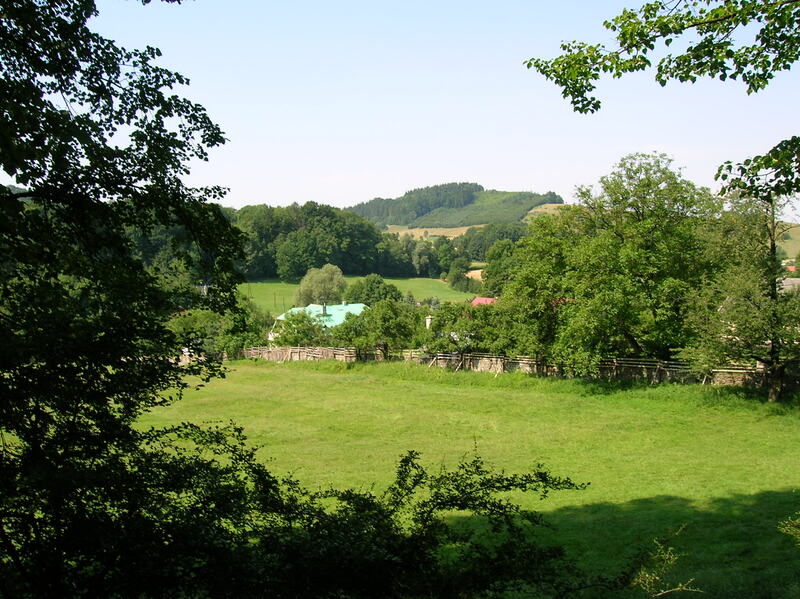 The music of Leoš Janáček, a native of this village, kept racing through my head. All those compositions inspired by Moravian folk music, the unique melodies and specific, repeating motifs. 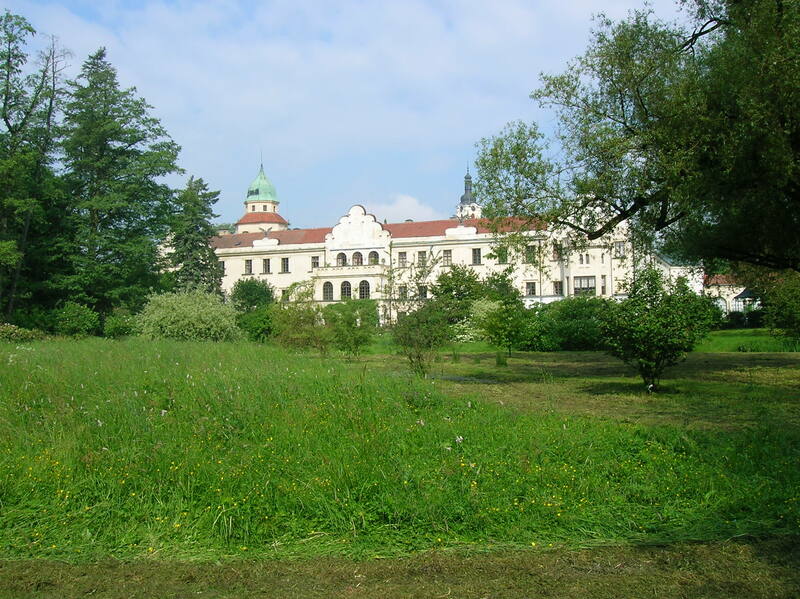 Before I came to the castle, I had stopped at the local school, where Janácek was born, the ninth child out of 13, on July 3, 1854. The castle dates from the 13th century. I skimmed over a brochure about the castle’s history. The monument dates from around 1285. 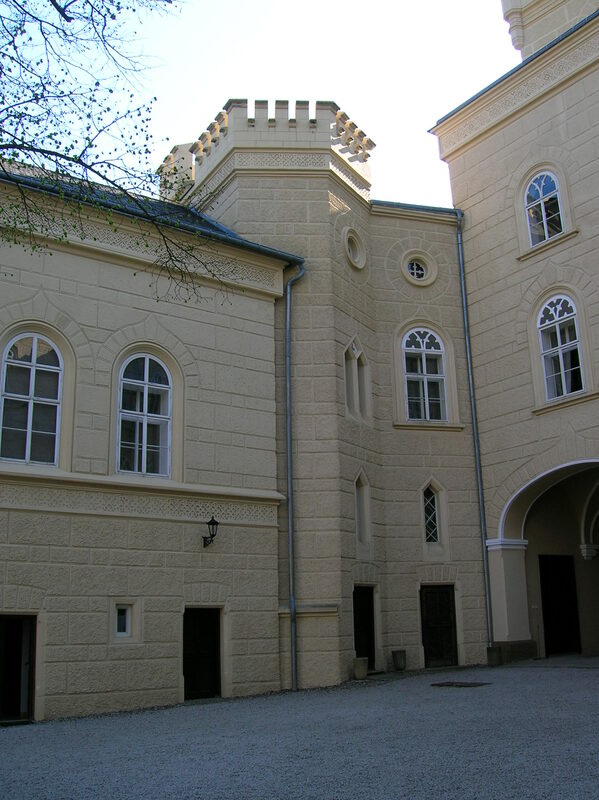 Olomouc bishops gained ownership of the castle in the middle of the 14th century, then the castle changed hands several times before King Jiří of Poděbrady bought it during 1465 in order to return it to the bishops. From that point on, the Olomouc bishopric and later archbishopric were almost continually the owners of Hukvaldy until it became state property in 1948. The ruins even have their own ghosts. 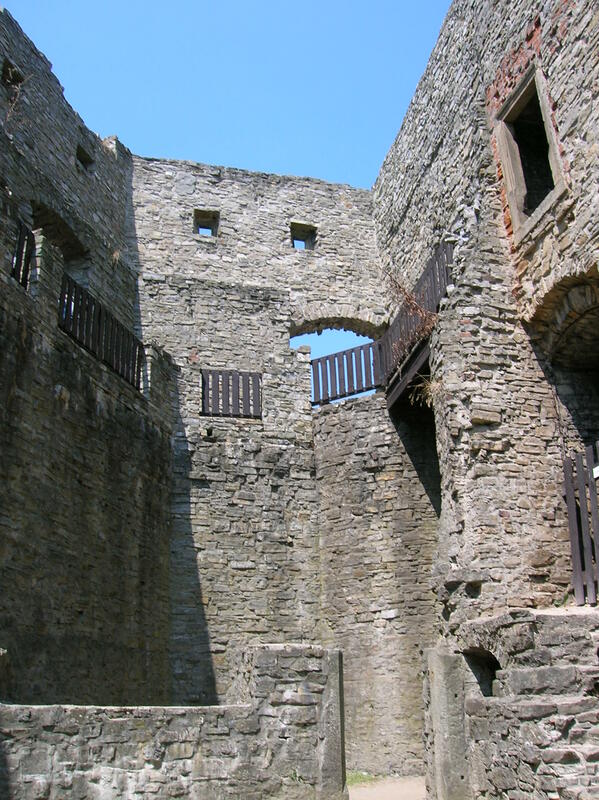 The castle became a ruin in the 18th century. 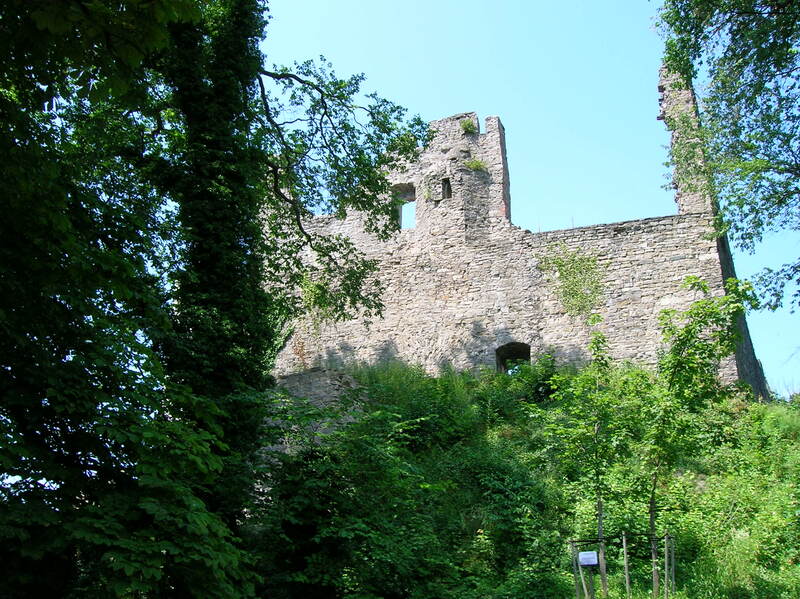 The once vibrant castle became a ruin in 1762, when a fire broke out after lightning struck the fortress. 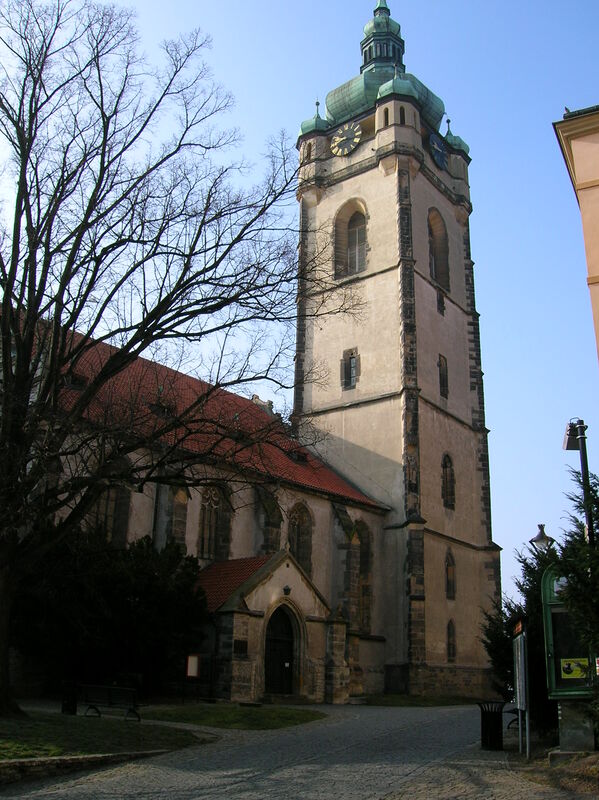 Yet the Chapel of Saint Ondřej remains almost untouched since its construction during the end of the 17th century. 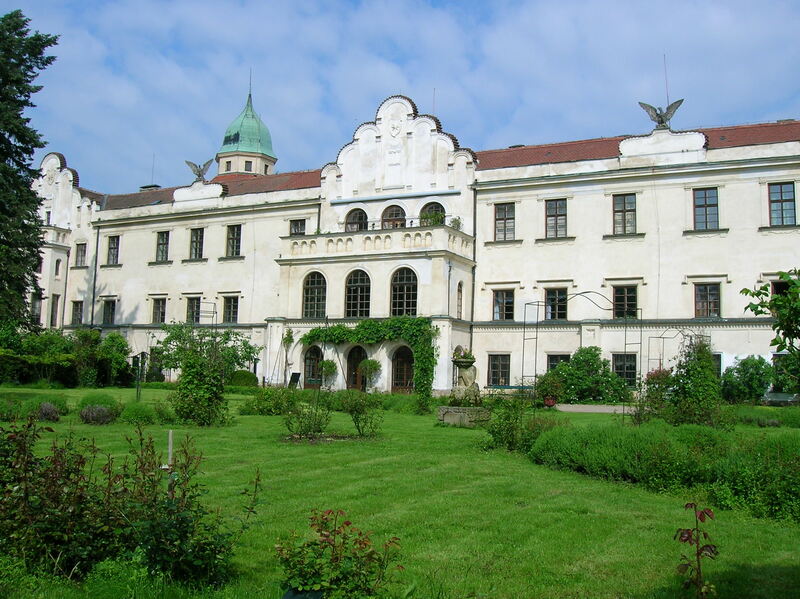 Decorated with statues of Jan Nepomuk and František Xavier, it is a real, though small, gem. Hukvaldy even has its own ghost named Světlík, who was killed by a hejtman that wanted to marry his beautiful daughter. Světlík refused to let him do so. The castle had a famous prisoner, too. 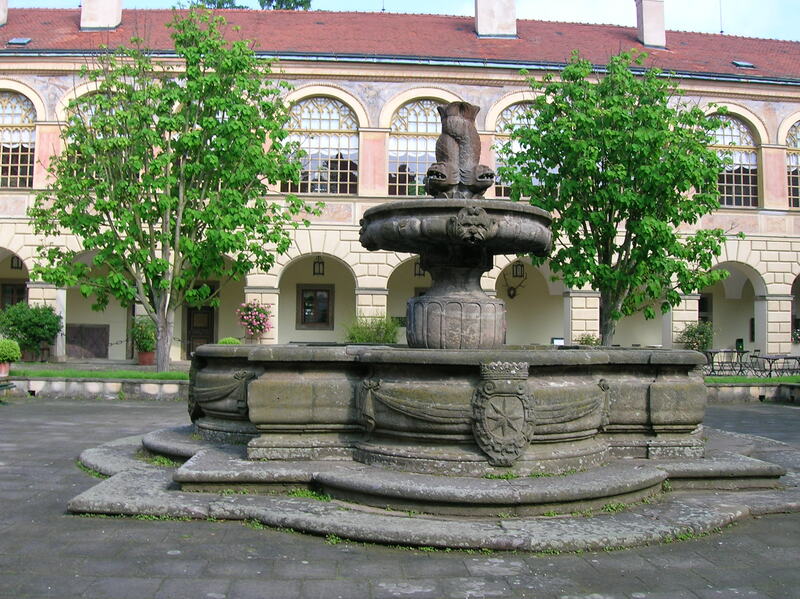 Philip Dambrovsky was accused of poisoning four Olomouc bishops. As I walked through the gates and courtyards, strolled around the bastions, peeked into the cellars and took note of the destroyed buildings that were once occupied by the burgrave, I felt energized from the power that was emitted by the stone walls and fragments, as if this place had a significant story to tell and was telling that story as I stepped through its magical gates. You can almost hear Janáček’s music coming from the ruins. 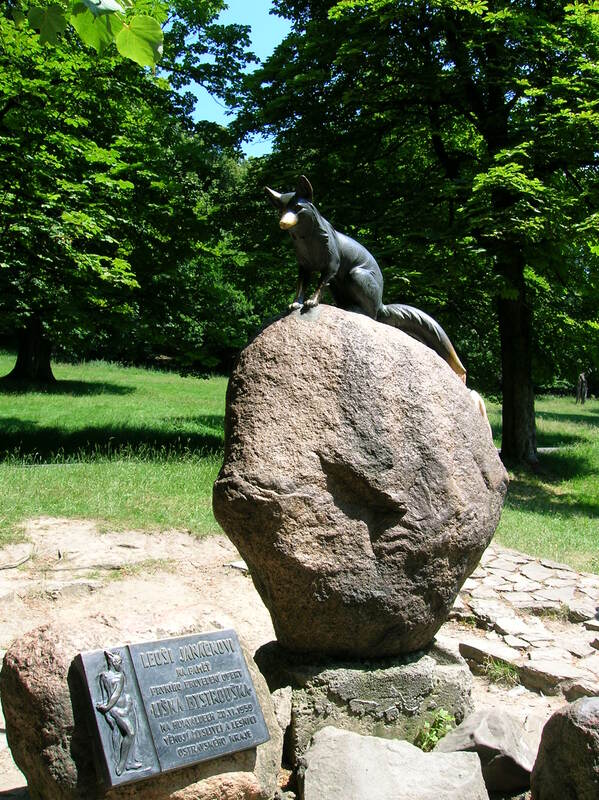 A statue of a fox commemorating Janáček’s opera, The Cunning Little Vixen. The views of the mountains in the distance are sure to amaze. I had taken this train many times before, usually to Turnov, which was one stop further than today’s destination – Mnichovo Hradiště. The last time I had taken this route, the train had been furnished with new, comfortable seats, though the exterior had appeared dilapidated. This time, the seats were the usual ugly, red, vinyl kind divided into compartments that looked dirty. After riding the pleasant Viamont train to Bečov nad Teplou, I guess I had become a bit spoiled concerning train travel. The trip took about an hour and 45 minutes, and it took another 15 minutes to walk through the pleasant town to get to the chateau. I remembered the chateau’s exterior from my visit here about 10 years ago, but it looked as if the walls had seen a few fresh coats of paint since my first time here. There were three parts to the tour – the Empire style theatre for about 50 or 60 spectators, the interior rooms with mostly 18th century furnishings and the lapidarium where 25 statues were kept in the church and chapel of a former convent. The guide and I started with the tour of the theatre. On the way there, we stopped in a hallway where I saw large portraits and Baroque bureaus. A huge painting traced the genealogy of the Waldstein family, the clan who had owned the chateau for generations. I picked out Vilém Slavata from Chlum and Košumberk in a long, red robe and big, red cap in one portrait. 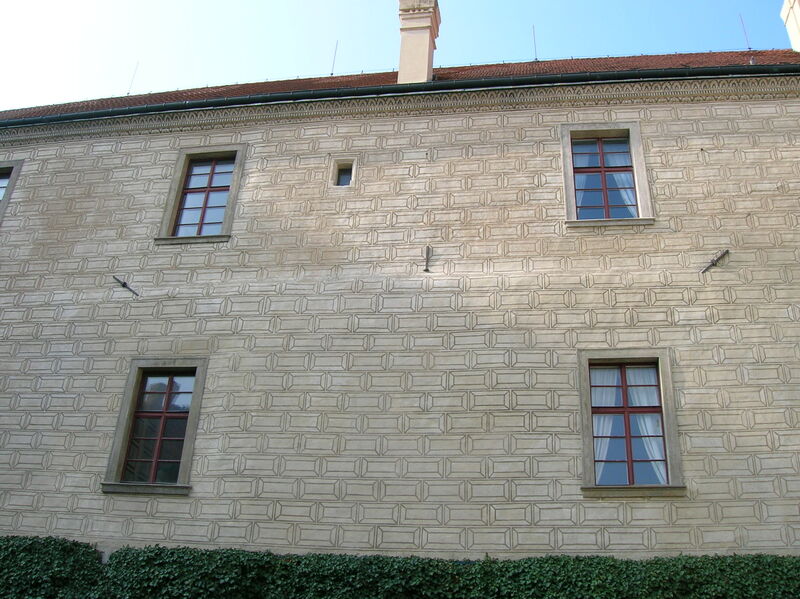 I had visited enough chateaus to know that this nobleman and writer had been thrown out a window of Prague Castle during one of Prague’s defenestrations. Thankfully, he had fallen on a heap of manure. Passing the Hunting Hallway, I glanced at black-and- white graphics of various animals and noticed a depiction of a deer with one antler. Then we came to a machine that made the sound of wind. By turning a lever, the round, wooden contraption with a white sheet over it moved to produce the sound. Then we entered the Empire style theatre. I took a seat on a bench that resembled the original seating. 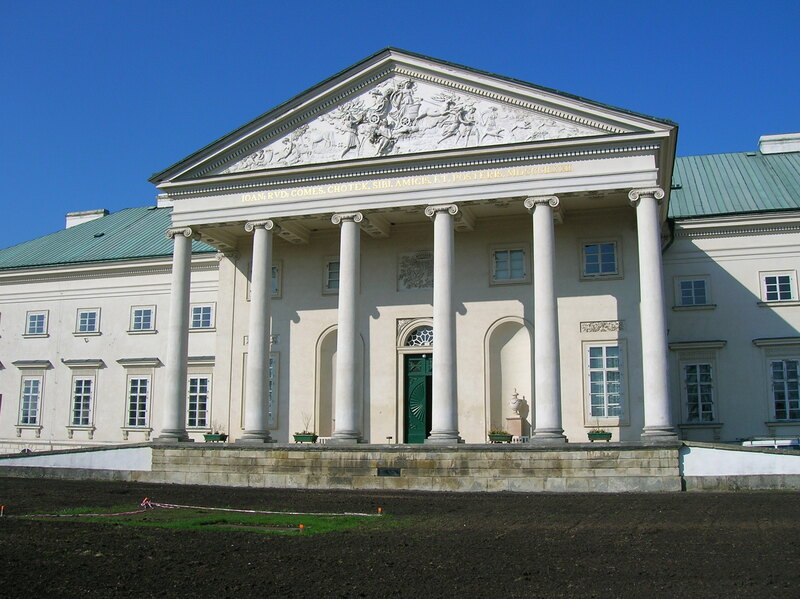 While the theatre was first mentioned in archival documents during 1798, it was renovated and given an Empire style appearance in the early 1800s on the occasion of the Holy Alliance negotiations, when Austrian Emperor Franz I, Russian Tsar Nicholas I and Prussian Crown Prince Frederick William discussed how to handle the revolts taking place throughout their lands, during 1833. 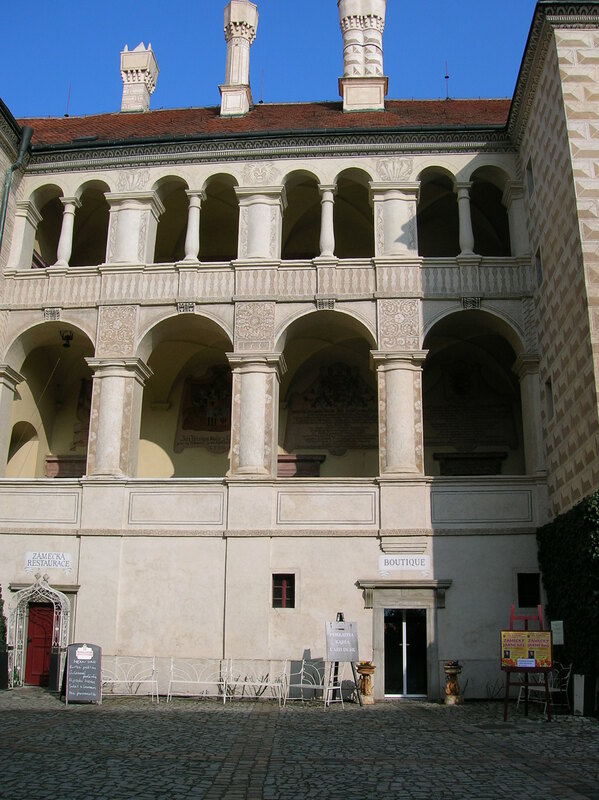 The first play performed here was Carlo Osvaldo Goldoni’s The Servant of Two Masters, performed in German and Czech by actors who came from Prague. 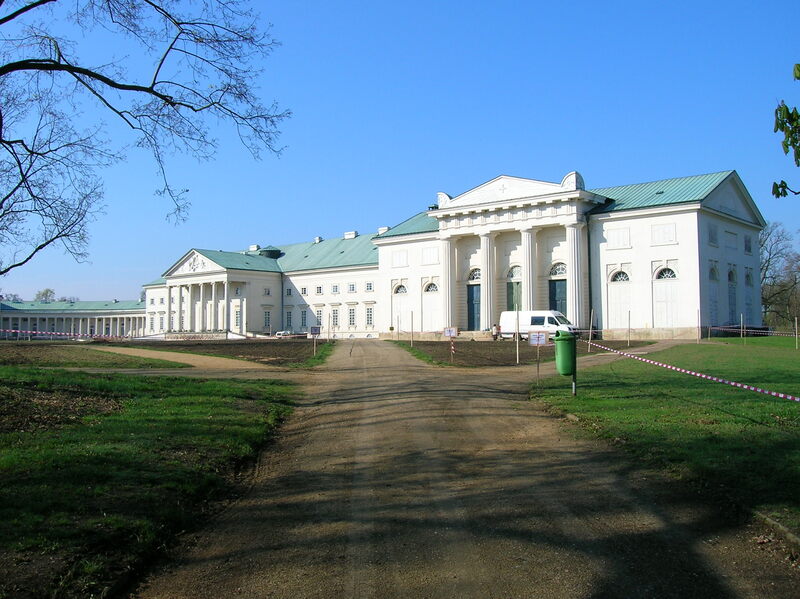 Three theatre groups from Prague’s Theatre of the Estates gave performances here for three nights. In the second half of the 19th century, the theatre fell into disrepair and was used as a furniture warehouse. It was not open for the public until 1999. The curtain was restored in 2001. I was enthralled by the romantic landscape backdrop that was currently on display. It gave me a soothing, calm feeling. Some of the 11 plain, flat backdrops that the theatre possessed included a street view, a castle, a hall with columns and Prague Castle with the Lesser Quarter and Charles Bridge. The stage was 32 feet wide, 28 and a half feet deep and four feet high while the proscenium opening was 22 feet wide and 13 and three-fourths feet high. The theatre had one curtain and 54 wings, which were set at an angle to the stage instead of being placed parallel to it, as was the usual custom. The theatre did not use a mechanized wing system or wing trolley, either, but rather employed a groove system that utilizes upper and lower grooves to assure that the wings will stay upright. Also, the wings in this theatre were double-sided and therefore could be reversed easily. On the back wall behind the balcony a large genealogy painting of the Waldstein family, complete with cherubs, caught my attention. It celebrated the family’s pride of its heritage. The theatre is still on occasions used today. The chateau had an intriguing history. It was built in the 17th century, during Renaissance times. The owner Václav Budovce of Budov joined forces with other nobles in a revolt against the emperor and was executed on Old Town Square in Prague during June of 1621. 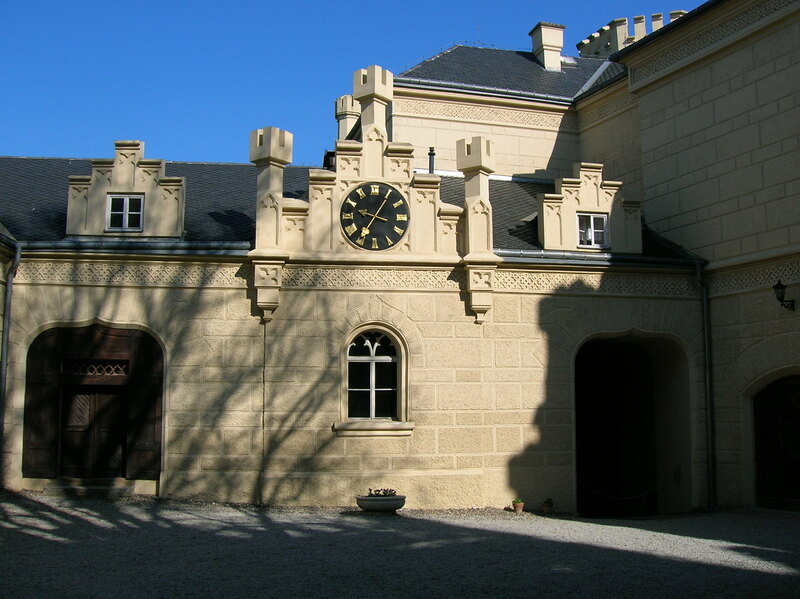 In 1623 the chateau was confiscated and subsequently bought by Albrecht Eusebius of Waldstein. 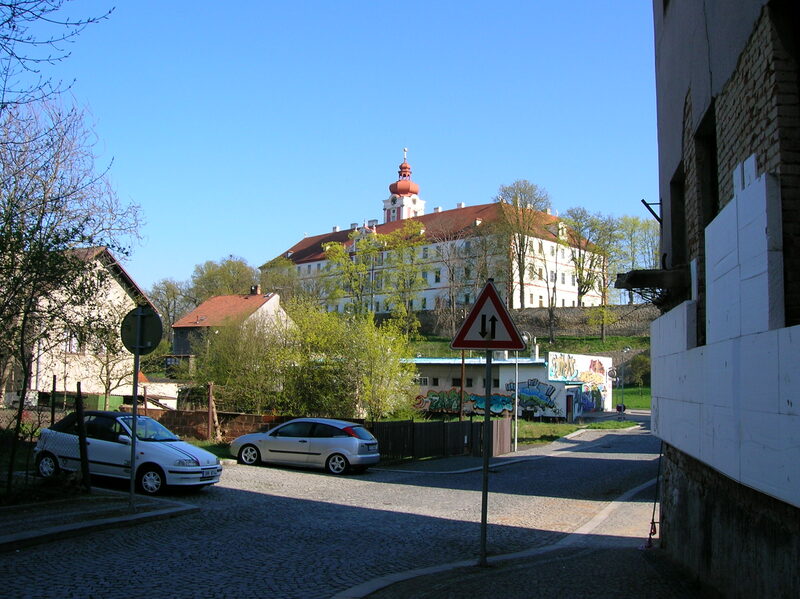 In 1675 Arnošt Josef of Waldstein purchased it and kept it until the middle of the 20th century. 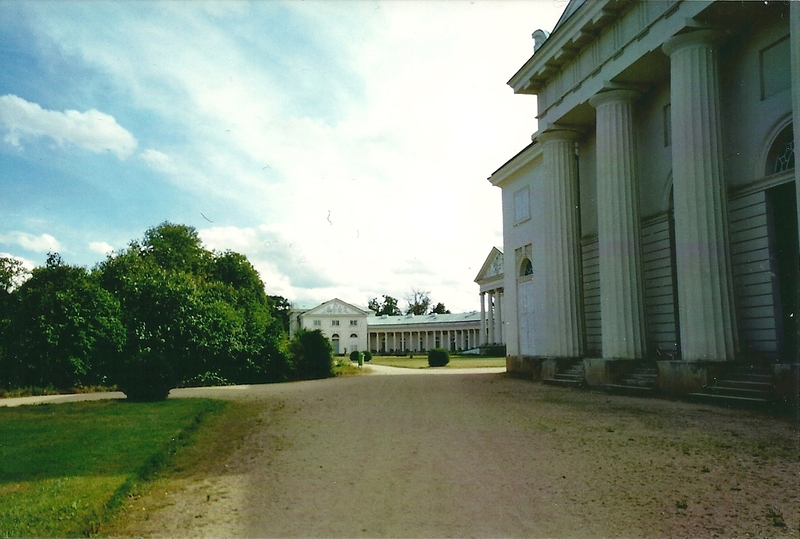 The chateau was given a Baroque appearance in the early 1700s, although some rooms were given a Rococo makeover around 1750. In a hallway full of portraits, I spotted the pointed beard of Albrecht of Waldstein, the one who had bought the chateau in 1623. A large painting explained the genealogy of Emanuel Arnošt of Waldstein. The guide said that when the researcher could not find all the ancestors of the Waldsteins, he made them up. The large, grey, puffy wig that Maximilian of Waldstein was wearing caught my attention, too. I also noticed that Count Vincenc had only one eye open. There was also a room to the side, roped off. Leaning over the rope, I glimpsed a tiny chapel with a Baroque altar of Saint John of Nepomuk and a Madonna with child. The altar was flanked by black Corinthian columns with golden tops. Next came the Countess’ Antechamber. Someone had installed a 20th century telephone and placed it on a Baroque bureau, a sight which vividly contrasted the two eras, so far apart in technology and time. A still life painting adorned one wall, and a laundry basket with an exquisite floral pattern and muted yellow background sat on the floor. The stunning green, blue and brown chandelier symbolized the four seasons. I noticed that grapes stood for fall. The oldest painting in the chateau, showing an old lecherous man and a young woman whom I suppose was very naive, hung on a wall of the Countess’ Bedroom. I noticed how both figures had baby pink skin. Why a countess would want such a painting in her bedroom is beyond me. In the visitors’ book, a thick, red book on an ancient desk, I could read the names of nobility such as Schwarzenberg and Lobkowicz. The Italian Salon enthralled me with its stunning mural spanning three walls. The painter had never visited the Italian town presented; rather, he had painted it from an etching. From the embankment of the town pictured, one could see Naples and Venice in the distance. Two men and a woman were talking in one section, nobles had gathered in another, and in yet another part two men manned the oars of a small boat. The Study, which later became known as the Music Salon, featured a piano with the white and black keys reversed. I had never seen a piano with this unique trait. The Baroque white tile fireplace was decorated with two sea monsters that were supposed to be dolphins, as they slivered through the water with their heads pointed down. Small portraits also adorned the Music Salon. One showed Habsburg Empress Maria Theresa dressed in black, mourning the death of her husband. The small picture gallery was roped off, which disappointed me. I wanted to study each painting in minute detail, but only was afforded a side view of the three walls totally covered in art. I noticed a woman reading while holding a skull and other paintings boasting hunting themes. Next came the Hunting Salon. The three walls were covered in a mural painted in shades of dark green and featuring a forest, dogs and hunters. I noticed that a backgammon game consisted of pieces with faces carved on them. The ceiling fresco was devoted to Diana, goddess of the hunt. She held an arrow; one of her plump breasts was bare. The room also boasted a secret door. The biggest room in the chateau was the Dancing Salon or Reception Salon, Rococo in style. A mirror sat flat on a round table that looked like a three-tier table for cakes wheeled around in luxurious restaurants. Porcelain figures decorated the three tiers while murals decorated two walls. I spotted this very chateau in the background of one part of the mural. Men clad in red with dogs were seen in a forest as a woman stood in the doorway, something having caught her sudden attention. The Ladies Salon featured murals on four walls. They showed a countess posing in different professions. She was portrayed as a dancer, a flower-seller, a hunter, a fisherwoman and a traveler, among others. In the depiction of the countess as a flower-seller, I took note of the English park in the background and the flowers that decorated her hat. I was enamored by the backs of the chairs on which landscapes had been painted. The floral cushions were exquisite as well. The most beautiful room in the chateau, in my opinion, was the Delft Dining Room that is immersed in blue-and-white Delft Faience porcelain from the 17th to 19th century, all original and handmade. I noticed some geometrically shaped vases and admired the wooden compartment ceiling, too. The Waldstein gold with blue coat-of-arms decorated the center of the Renaissance ceiling. I noticed some plates on a wall featuring windmills while a tray depicted a park with a fountain and statue. The Oriental Salon was full of Japanese and Chinese porcelain. I admired the orange and blue swirls of one Chinese plate hanging on a wall. The table and chairs were made of bamboo. Four vases represented the four seasons. A Japanese painted partition also adorned the room. The table in the Meissen Dining Room was set for breakfast with its blue-and-white porcelain taking center stage. Yet what astounded me about Meissen craftsmanship were the chandeliers. Hailing from the beginning of the 19th century, this particular chandelier featured floral decoration colored green, pink, yellow and orange. Although the library was composed of three rooms, a gate with bars prevented visitors from entering. This was the library where Giacomo Casanova had served as librarian during the 18th century, the guide reminded our group. His letters and manuscripts made up a significant part of the chateau archives, as did material from the Thirty Years’ War. I wished I could see more of the 22,000 volumes inside the gate as the shelves were decked with fiction as well as specialized literature, such as legal and historical works. Many books focused on alchemy, too. They were written in a variety of languages, including German, Latin, Czech, Italian and Hebrew. Two big globes stood in the foreground while a smaller globe and telescope could be seen in the background of the closest room. Walking through a hallway before descending the stairs, I spotted a large portrait of an armor-clad Albrecht of Waldstein on a gray, spotted horse. Then it was time to visit the lapidarium. The church and chapel of the former Capuchin convent appeared to be plain, nondescript. The exterior was even dilapidated. What was inside, though, proved absolutely stunning and breathtaking. As we first entered the Church of the Three Kings that joined the Chapel of Saint Anne, I saw about six small statues in a dark, small space. This will be disappointing, I remember thinking to myself. Then we turned the corner, and the room came alive with 25 statues of Baroque, Rococo and Empire style twisting and turning, dynamic and vibrant, most made of sandstone. Home to these statues since 1966, the lapidarium featured monuments that had been deteriorating in the outdoors. Our group stood in front of the headstone of Alburtus de Waldstein, the name engraved prominently on one wall in what looked like marble. Then I walked through the room, my head spinning from all the dynamic and expressive movement flowing from the statues. I inspected the altar of the Saint Anne Chapel and noticed that Saint Anne had a child on her lap as they were reading, cherubs fluttering above. Next to them a figure seemed to be holding a painting. Then I took in the statues. In a sandstone work hailing from the third quarter of the 18th century, the Virgin Mary had her hands clasped to her breast. 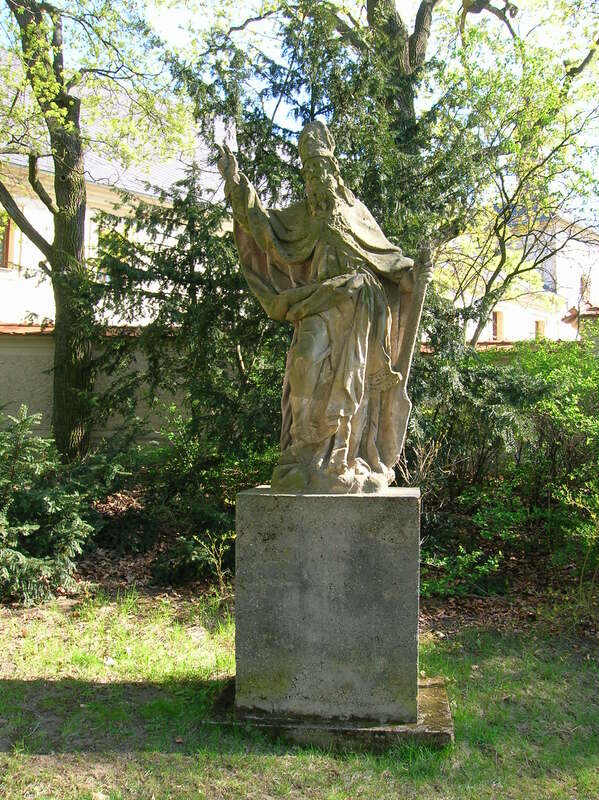 A Saint John of Nepomuk portrayal by Josef Jelínek the Elder, dating from the second quarter of the 18th century and made of polychrome wood, featured that saint as a sort of visionary, peering into the distance, determined and confident. I noticed the dynamic folds in his white drapery. It looked as if they were fluttering in the wind. Another statue, named the Angel with the Attribute of Christ’s Suffering, had been erected in the early 1720s out of sandstone. I was stunned by the angel’s huge wings as the angel seemed to be moving toward the viewer, about to trample him or her. I also noticed the angel’s crushed nose and wished the statues were in better condition. If I was a millionaire, I would donate money to preserving Czech chateaus and castles, so that fascinating statues such as these could be restored. The Lion and Putto, by master Ignatius Francis Platzer, was made of sandstone and hailed from the 1750s or 1760s. Putto, clutching a shield, was riding on an enormous lion. Perhaps the best known statue in the collection was Matthias Bernard Braun’s Perseus, a sandstone work from the early 1730s. Perseus appeared calm, not at all tormented, and I took note of his fluttering drapery and twisting body. Then I walked over to Saint John of Nepomuk with Two Angels by Karle Josef Hiernle, a sandstone piece from 1727. John of Nepomuk was flanked by two angels. One angel lightly touched the sleeve of John of Nepomuk’s garment. An angel held a finger to his lips, while the other pointed toward Heaven. Cupid heads decorated the bottom of the sculpture. John of Nepomuk ‘s head was leaning to the right, his hands were clasped and his eyes closed as if he were meditating. After thoroughly enjoying my inspection of the statues, I went to lunch, where I ate my favorite chicken with peaches and cheese. Soon afterwards, I took a bus from the main square directly to Prague. Once again, I was fascinated by everything that I had seen in the chateau, and I needed time to process all the information and all the beauty that had surrounded me. 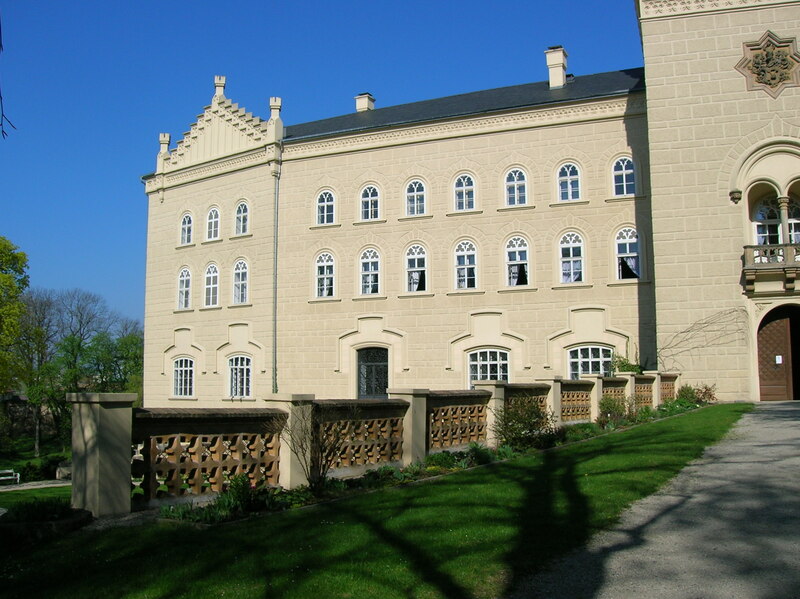 It only took an hour to get to Kutná Hora by train and then a short taxi ride to the sprawling white-columned, two-floor chateau of Kačina, sporting an elegant tympanum on its main façade. Unfortunately, there was not any public transportation from Kutná Hora to the Czech sightseeing gem, and I did not have a car, so I had to take a taxi a short distance. 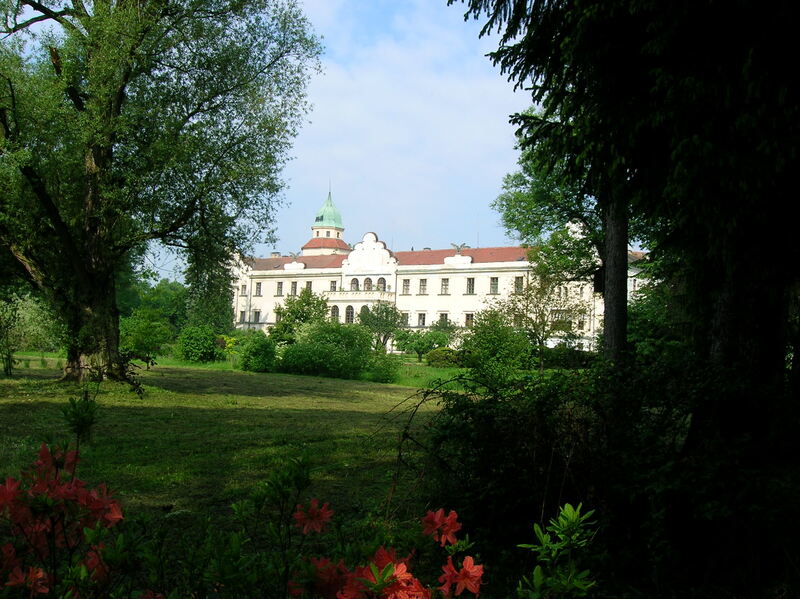 The huge chateau – the biggest 19th century Empire style chateau in the Czech lands – boasts not only representative rooms in 19th century Empire, Biedermeier and Classicist styles but also a 19th century library, theatre and pharmacy plus an agricultural museum. An unfinished chapel is on the vast grounds as well. 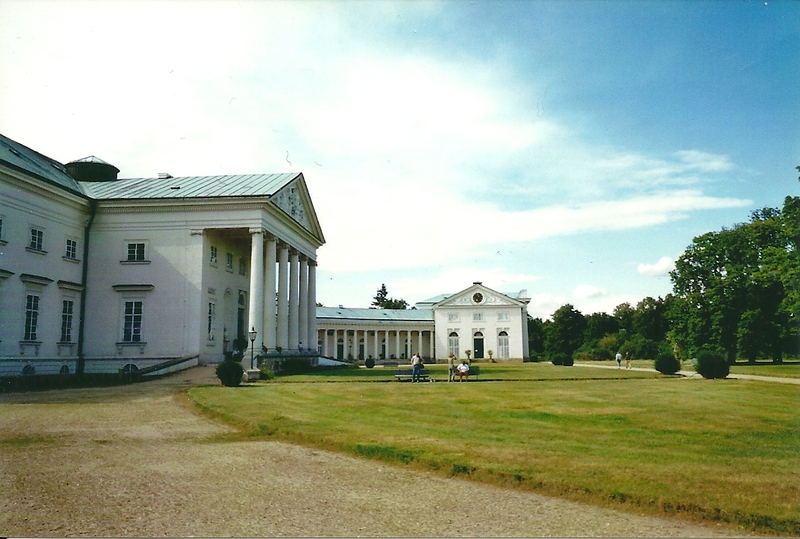 The chateau was built from 1802 to 1822. The balanced Empire style hails from the early 19th century when symbols and decorations were influenced by ancient Greece and Rome. Biedermeier style, from 1815-1845, refers to furniture that is simple yet elegant with very little decoration. During this period ebony, cherry, ash and oak woods were often used. The Classicist trend can be defined as symmetrical, proportional and geometrical, taking its name from the style utilized in Classical antiquity and that of ancient Rome. Architecture of this style is very well-organized with columns, pilasters, lintels, hemispheric domes and niches. I was lucky that I had a guide who was so enthusiastic and knowledgeable about the place. Her zeal was contagious. She was exactly the kind of guide I wished I had had on every tour I had taken. The details of each room just spewed spontaneously from her mouth. She even took me to parts of the chateau that were usually off-limits to tourists. First, we hit the representative rooms. The ground floor consisted of the spaces used for social occasions and guest rooms while the first floor, which cannot be visited, had been made into a family residence. The first room we walked into took my breath away. This hallway with a roundel or circular window that is 16 meters high was so light and airy yet elegant that it reminded me a bit of the Pantheon in Rome. We continued into a hallway with some hunting trophies and black-and-white British lithographs sporting hunting and horse-jumping themes. The first three rooms, formerly guest rooms, gave background information about the chateau and explained the history of the Chotek family, who had chosen this chateau as their summer residence during the 19th century. Models of chateaus adorned each room, such as the blood red model of Veltrusy, destroyed by the 2002 floods, the chateau where the Choteks had once had their family residence. In a portrait Jan Rudolf Chotek, the founder of Kačina, looked as if he was harboring a secret he would never reveal. First, you need some background about the Chotek family. 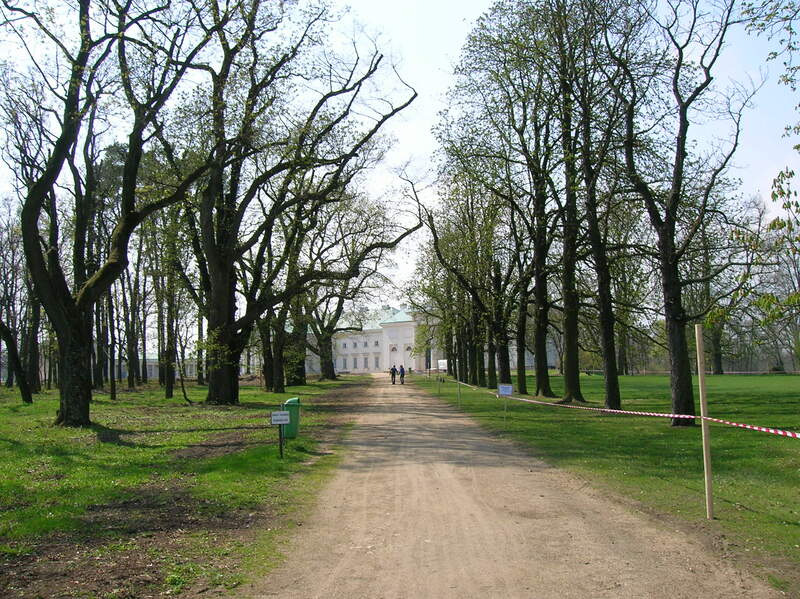 Veltrusy Chateau was their family residence from 1716 to the 20th century. Jan Karel served the emperor as an armorer, and his youngest son Rudolf worked as the highest chancellor in the Czech lands. Because he did not have a son, his nephew Jan Rudolf took over in the 18th century. 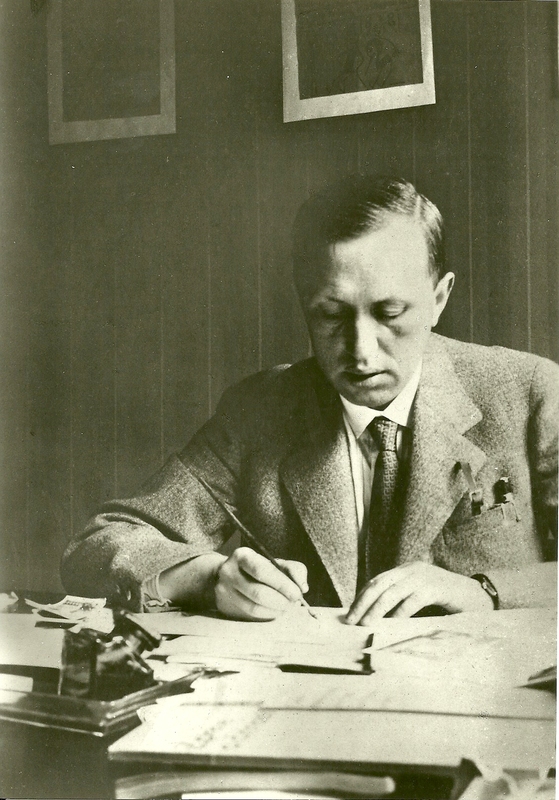 Jan Rudolf was a man of many achievements. 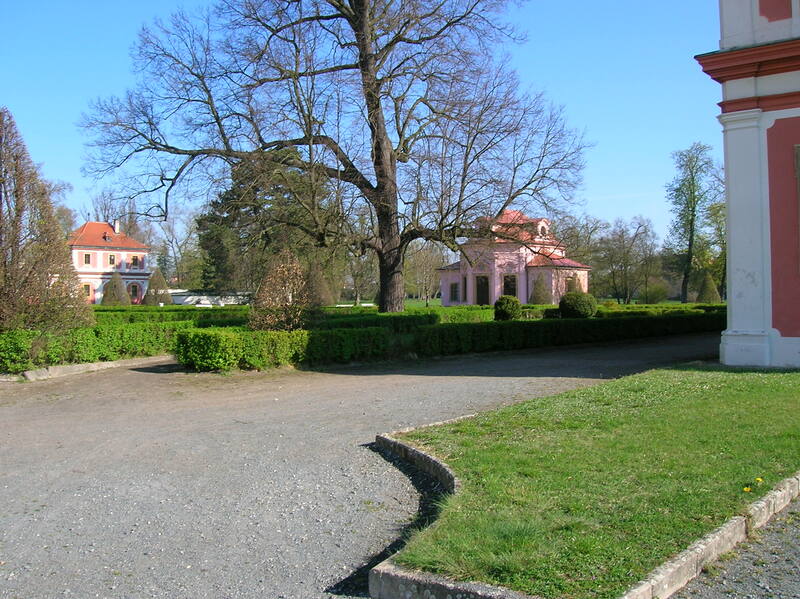 He built the magnificent park in Veltrusy and Kačina chateau in the 19th century. He was responsible for the construction of many embankments and parks throughout the Czech lands. His youngest son Karel spent 17 years as the highest Czech burgrave and built the highway between Karlovy Vary and Mariánské Lážne. 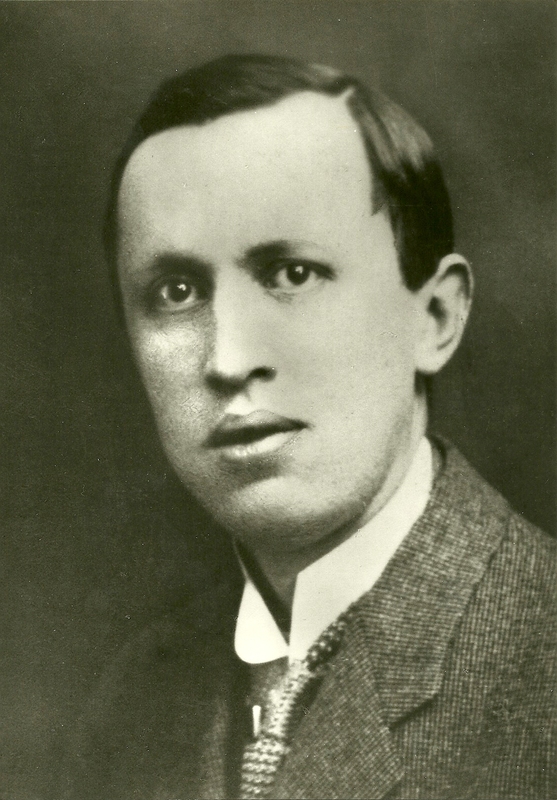 He even learned Czech from legendary historian František Palacký. 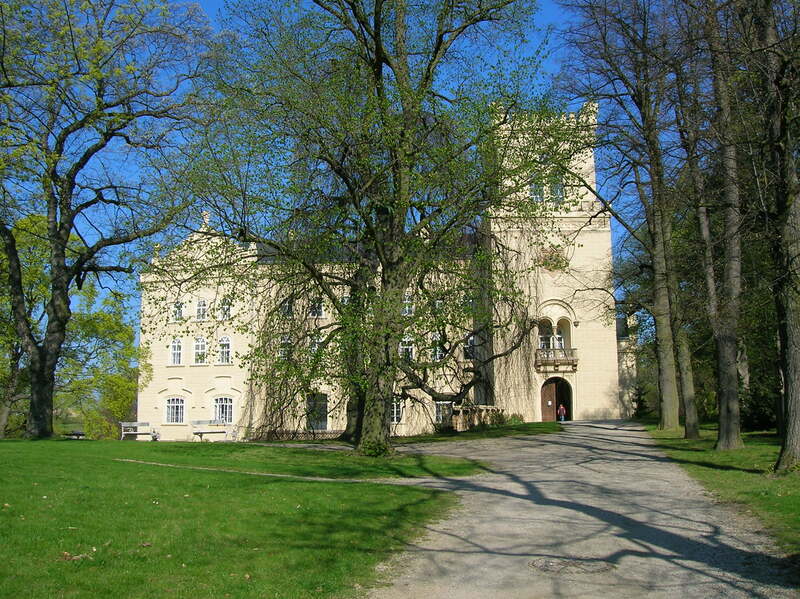 He also established a residence at Velké Březno chateau, built from 1842-1854, in northern Bohemia – a green building that looks like a hunting lodge. 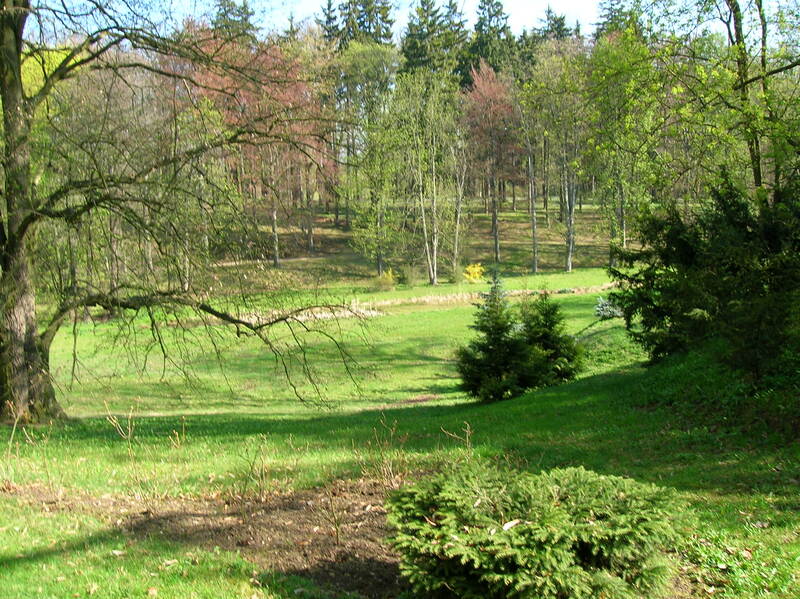 I fondly recalled my trip to Velké Březno, where I had looked out the window at the park, suddenly feeling free of stress as if I had been cleansed of my worries. Ferdinand Maria Chotek, the fourth son of Jan Rudolf, was the Olomouc archbishop for four years. Žofie Chotková married František Ferdinand d’ Este, both of whom died during the assassination attempt during 1914. The last male Chotek was Karel, who along with his wife Lívie became German citizens after World War II and emigrated to Germany. During the war the chateau was sold to the Germans, and the HitlerJugend resided there. 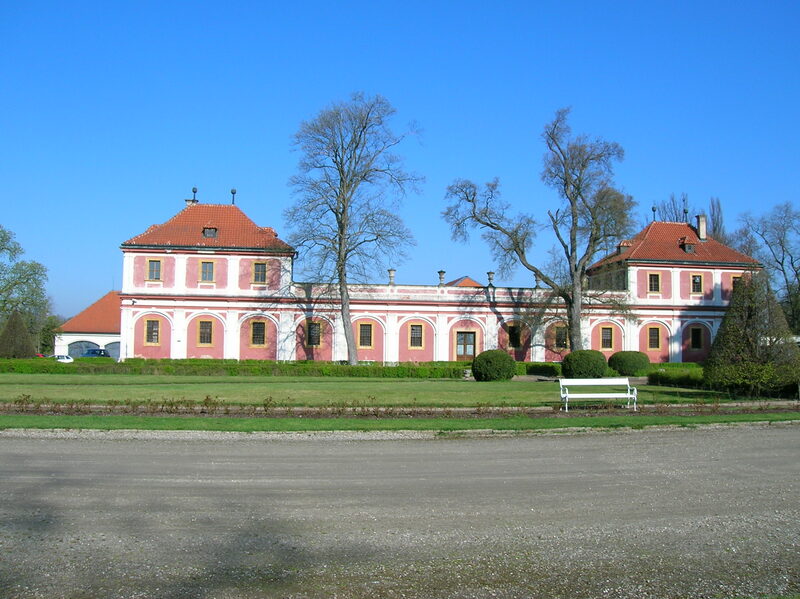 The chateau was nationalized after the war according to the Beneš decrees, which gave property owned by Germans during the war to the state. In 1950 the chateau belonged to the Ministry of Agriculture, and it became an agricultural museum. Now the chateau looks as it did when Jan Rudolf lived here. The coat-of-arms for the Chotek family shows a half wheel, a gold bear in a blue field and a black imperial eagle on gold. The ladies’ wing was first, then the men’s wing. The Ladies’ Study boasted pink and grey decor with white ornamentation. Family portraits adorned the walls as did pictures of three summerhouses that once graced the park, founded as far back as 1789 and now composed of 20 hectares with 61 kinds of trees and 20 kinds of bushes. An oil painting depicted knights readying for a tournament on Chotek property. I gazed at a square, gold clock in a gold frame, positioned high on a wall. I was drawn to the geometric symmetry of the square design. Next was the Pink Salon. The original chandelier was second Rococo in style, gilded with gold and dominated by Czech crystal. An Empire style small black table with gold legs and a circular table with the same decoration got my attention. Pink and white porcelain dominated a circular table in the middle of the room. Corinthian columns were painted on the walls. The Ladies’ Bedroom included some magnificent intarsia furniture. A picture with cupids was carved into a wooden bedframe. I immediately took to the Empire style black-and-purple closets for accessories in the Ladies Changing Room. A light pink chair and couch complemented a Venetian mirror decorated with black and pink. 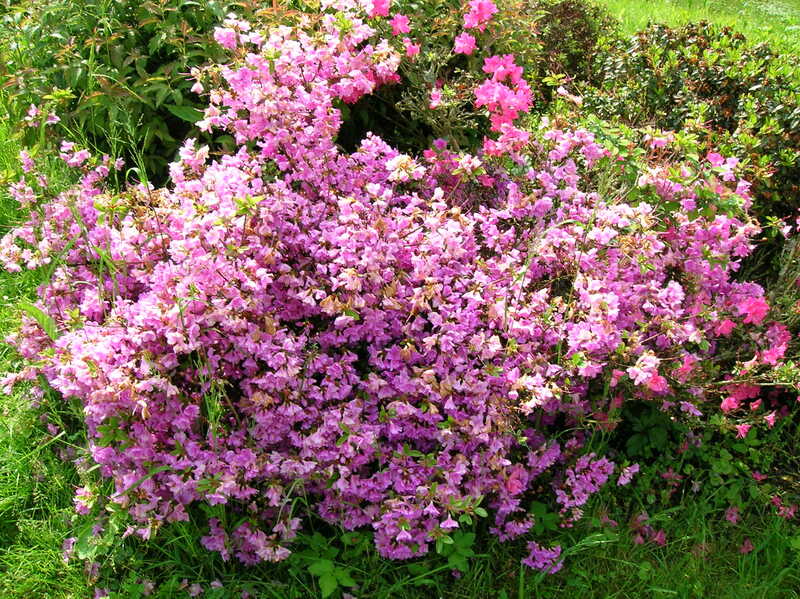 The purple, pink and black colors went together superbly, I mused. The Small Dining Room, still used for concerts, included an Empire style table and a Biedermeier side table plus a gold chandelier. The Dance Hall was 22 meters long, 12 meters wide and 16 meters high with fantastic roundels. A crystal chandelier captivated me. The brown parquets on the floor sported circular and diamond shapes. I noticed two unique, tall and narrow flower stands. From France, they were decorated with figures of two black women. For a moment we stood on the terrace and took in the vastness of the park land around us. The Men’s Salon had a Baroque pool table, but it was the Renaissance brown tiled stove that entranced me. The unique feature of the room was the oak leaf motif. I recalled that oak was often utilized in the Biedermeier style. Wooden circles with oak leaf motifs decorated the ceiling and the tops of the walls. Frames were also covered in wooden oak leaf ornamentation. The couch and chairs were Second Rococo in style. I noticed that the armchairs where the Choteks sat when playing cards were very low. I wondered what sort of conversations had taken place there while the Choteks had played cards. What had they talked about? What were their interests and worries? What events had brought them joy? Vienna porcelain and Czech glass also lit up the room. The white stove in the Music Room had white décor and hailed from the Second Rococo period. I also noticed a Baroque bureau and two big portraits of Jan Rudolf Chotek and his youngest son Karel, both wearing prestigious golden medals around their necks. Jan Rudolf was holding a plan of Kačina in one hand while Prague dominated the background of Karel’s portrait. The ceiling with white wallpaper sporting green and pink flowers was not perfect; there was a space that got wet when damaged during the 1960s. Seeing the imperfection only made the room more real and more appealing. The furniture in the Men’s Study or Smoking Room was captivating as well. The green couch and chairs were Empire style as was the chandelier. The desk hailed from the Biedermeier period. I notice a small statue of Empress Elizabeth, fondly called Sissy, on a desk top. I thought about how she had loathed the strict regimen of royal life and how she danced to the beat of her own drum. She had become a symbol of individual identity during her 44-year reign as the longest reigning Austrian empress. She had been so independent, traveling around the world. And she had had to deal with so many tragedies. A large portrait of her husband, Austro-Hungarian Emperor Frantisek Josef I, also hung here – in the painting he was a young man with many medals on his uniform. The young man in that painting would become the most respected and most beloved member of the Habsburg dynasty, ruling the Austrian Empire and then Austro-Hungarian Empire for 68 years, the third longest reign in the history of Europe. On another wall was a huge brown map of the Chotek property as of 1734. The guide pointed out that the fields were numbered. There was also a secret door to the south colonnade, but we went downstairs instead to see the former bathroom, which was a large hole in the dilapidated floor. The person taking the bath used to sit on a chair in the tub while servants poured water over him or her. We trekked upstairs again, this time to the Men’s Bedroom. The prayer stool was made with intarsia, wooden with wood decoration. Paintings with religious themes also adorned the room. Plants made the room come alive. In the Men’s Changing Room there were small paintings of Italian towns on the walls. The chandelier hailed from the Empire period. The Hunting Salon was dominated by a polar bear rug. I noticed the animal’s sharp teeth. That is an animal I certainly would not want to come face-to-face with. A white tiled stove boasted white ornamentation with two female figures on its sides. Oriental chairs also made up the space. The furniture was Baroque and pseudo-Baroque and included a Baroque bureau. The Big Dining Room featured a folding table that usually sat 24 guests during the Chotek’s days. The table was decorated with a green clover motif. Each chair had the coat-of-arms of the Chotek family with a crown on top. The rich wooden décor on the wooden sideboard got my attention. Ceramics and the Chotek coat-of-arms were displayed on the superb piece of wooden furniture. A Second Rococo mirror had a lavish gold frame with the coat-of-arms prominent at the top. The high walls were decorated with gilded wood, and an exquisite crystal chandelier hung from the ceiling. There was also a secret door. Next came the library, my favorite part of the tour. Roundels or circular windows with painted cupolas and stylized squares allowed light to stream into the three sections, onto the colored shapes on the floor. The library from the turn of the 19th century reminded me of a structure out of antiquity. The fake grey marble columns gave the place a dignified air. Tall bookcases were crammed with books, some of which looked like they had golden spines. A gallery above held magazines and newspapers. The Chotek coat-of-arms was present on all 40, 000 volumes, the guide said. Mostly written in German, the books also included publications in French, Spanish, Italian and old Czech. Some of the volumes were older than 1500 – the oldest was a book of Russian psalms hailing from 1480. Among the most significant in the space was the 18-volume complete set of the French Description of Egypt from 1809-1818, which consisted of encyclopedias that documented everything French military leader and political leader Napoléon Bonaparte had seen in Egypt, from plants to pyramids. There were only two other complete sets in the world: one was in the Louvre and the other in the King’s Library in England. These books were printed specifically for European rulers. The editions in the breathtaking space also included 398 handwritten manuscripts, 38 handwritten maps and 250 catalogues. Among the books, I saw downstairs in the first part were S. Dionysii Opera, a fat two-volume set and collections of Lumír magazine, established in 1851 and written by Czech patriots such as Karel Havlíček Borovksý, who is considered the founder of Czech journalism, satire and literary criticism. Tall medical books stood nearby. The second part of the library was a study with small statues of Czech rulers and one of Michelangelo. Among the 19th century statues, I spotted the mythical Libuše who prophesized the founding of Prague; Jiří of Poděbrady, a Czech king who ruled from 1458 to 1471; Emperor and Czech king Charles IV, who reigned from 1346 to 1378 and was responsible for founding Charles University, the New Town in Prague and the Charles Bridge; and Holy Roman Emperor and Czech king Rudolf II, who was in charge from 1576 to 1611 and is known for his love of alchemy and cultural pursuits. Then the guide showed me the object that enthralled me the most during my visit. It was a globe put together in eight layers. There were top and bottom layers and then six layers representing the continents. On one side was a picture of a continent, and on the other side there was information about it. I spotted a polar bear on one picture. It seemed to me to be an excellent visual teaching aide for young students. The third part was dominated by a huge vase with ornate décor. I could see Romulus and Remus with a wolf in relief on the exquisite object. Then the guide showed me an Empire style card catalogue, with a card for each book. The golden writing on the cards had been scribed in flowing, fancy script. Then we went up a narrow staircase to the gallery, a part that was usually off-limits to tourists. I spotted editions of the newspaper Prager Zeitung and sheets containing information about new publications in the Austro-Hungarian Empire. Illustrated magazines were also kept here. The guide even led me through the back study rooms. Paintings adorned the walls, and I spotted a grey tiled stove with white ornamentation. Each painting hung in one space had been executed with a different technique. A display case illustrated the technology of painting and materials for painters, such as paraffin. In another display case I saw handmade paper and an ancient book made from handmade paper. Yet another space featured brightly colored, dynamic scenes of Divoká Šárka Park in Prague, one painting for each month, though the set here was not complete. I was entranced by the green hills of the park I loved so much, where I felt so at home, one which reminded me a bit of Vermont. I was glad I lived so close to that park. It made me feel relaxed and worry-free. Soon we came to the 19th century pharmacy. One exhibit showed how to dry herbs, another displayed various baskets. A machine for mixing syrup was on display, too. I saw a press for making fresh herbs and a press for making tablets as well. The jars behind the counter and old scale came in various colors. A large book about herbs dated from 1920. Ceramic jugs also decorated the room. The theatre, on the opposite side of the chateau, hailed from 1851. It had never been open to the public. It was used only by the Choteks and their good friends. The Chotek family wrote the plays themselves in German and acted them out. 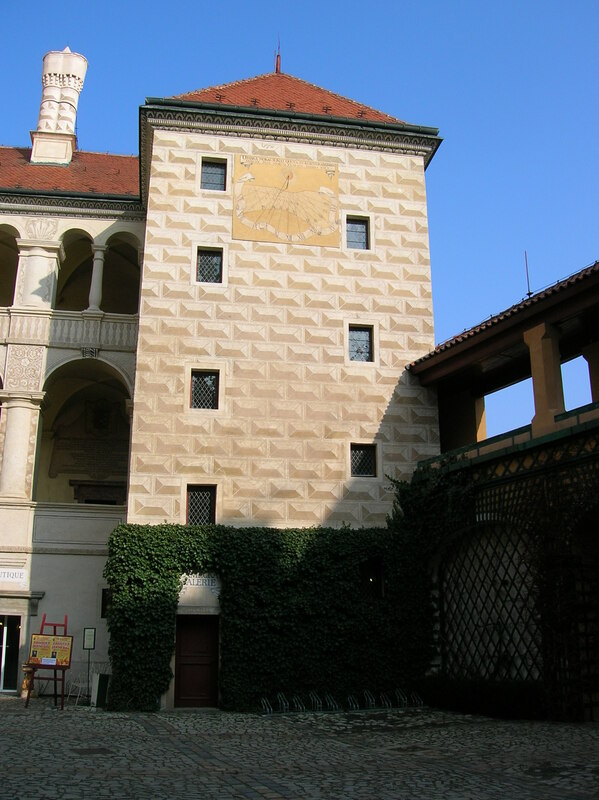 Jan Rudolf’s 15 plays on then current themes are now in Prague’s National Museum. The group had even prepared plays by William Shakespeare, tailoring them to their own needs. How I would have loved to have seen those plays! The stage was made of wood, but it was not original. 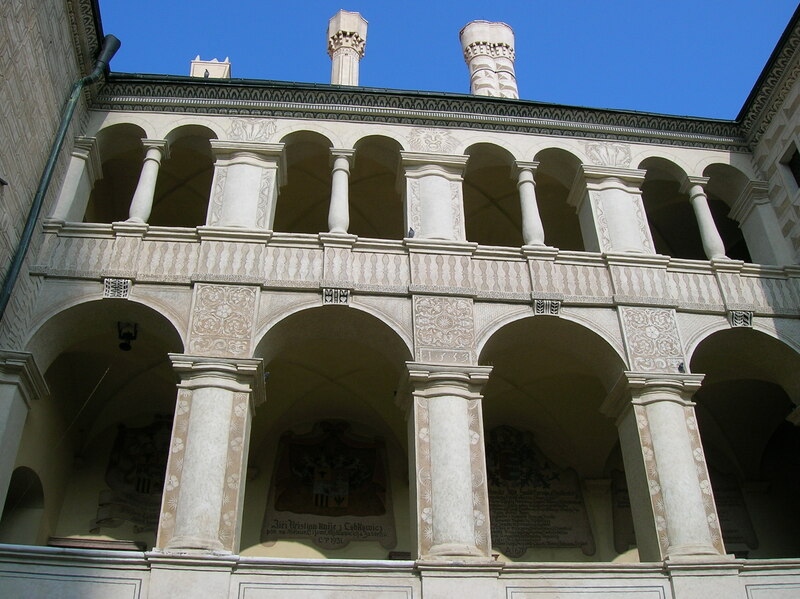 The walls were made of imitation marble on the lower section while stylized painting adorned the upper half. A compartment seated four people in the middle of the back wall. The two balconies boasted gold and black decoration. There was an orchestra pit, and there were pulleys above the stage. A crystal chandelier hung from the ceiling that had been partially damaged by water during the 1960s. Some set designs had been saved. The gallery now contained wooden benches, but it had consisted of comfortable chairs back in the Chotek days. There were bleachers for standing room at the top level. On the relatively new ceiling I spotted the two bears holding a coat-of-arms. Last but not least we visited the unfinished chapel, which was occasionally decorated with flowers and candles and used for weddings. What had been initially planned to be a crypt was only a hole because it was never completed. In the 1950s the floor had been cemented. Before that, it was made of earth. The cross-shaped structure was composed of rock with brick so it could be dry. I imagined how breathtaking the chapel would have looked if it had been finished in a simple and elegant Empire style, for instance. Then it was time to say goodbye to one of the best guides I had ever met. I thanked her profusely and went back to the souvenir area and ticket office to call a taxi to take me to nearby Kutná Hora, where sumptuous chicken lunch awaited me. I walked briefly through the picturesque town, up the hill to Saint Barbara’s Cathedral and along the bridge flanked by statues. Soon, though, it was time to head back to the train station and return to Prague.